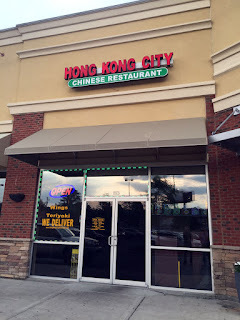 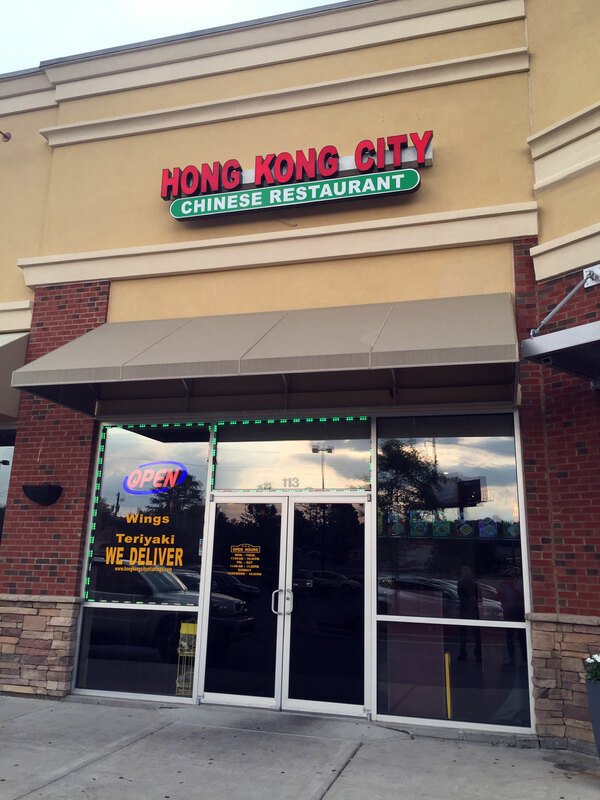 You can find Hong Kong City at 3979 Buford Hwy Ste 113, Atlanta, GA 30345 - this is the shopping center at the bottom of the hill that also has an Aldi location. 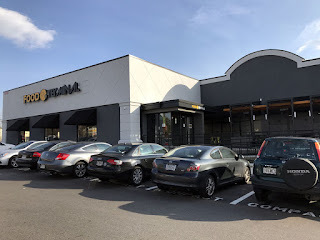 There's tons of parking and several other restaurants in the same shopping center. I came here on a Wednesday evening with my regular Buford Highway Restaurant Crawl group hosted by John F. If you've been following along you know that this is the second time we've done this, the original was in 2008-2009 - this time we started at the bottom of Buford Highway and we're moving up, stopping at just about every restaurant (plus a few that aren't technically on Buford Highway) every week. 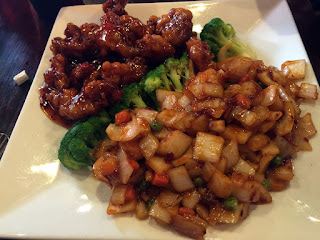 Tonight it's Chinese food. 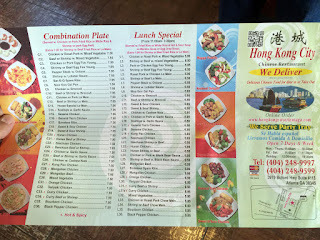 Hong Kong City is in about the middle of a long row of buildings - also nearby are the very good La Castilla Grill and of course the classic Cuban Havana Grill. 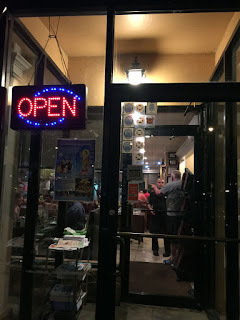 There are also two other recent additions but the restaurants seem to change names a bit - we passed on Mariscos El Malecon as it wasn't open. 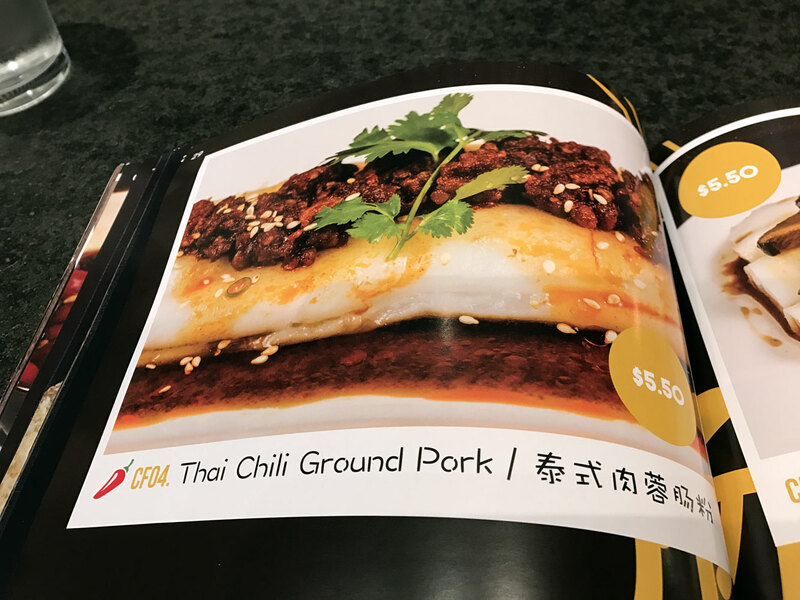 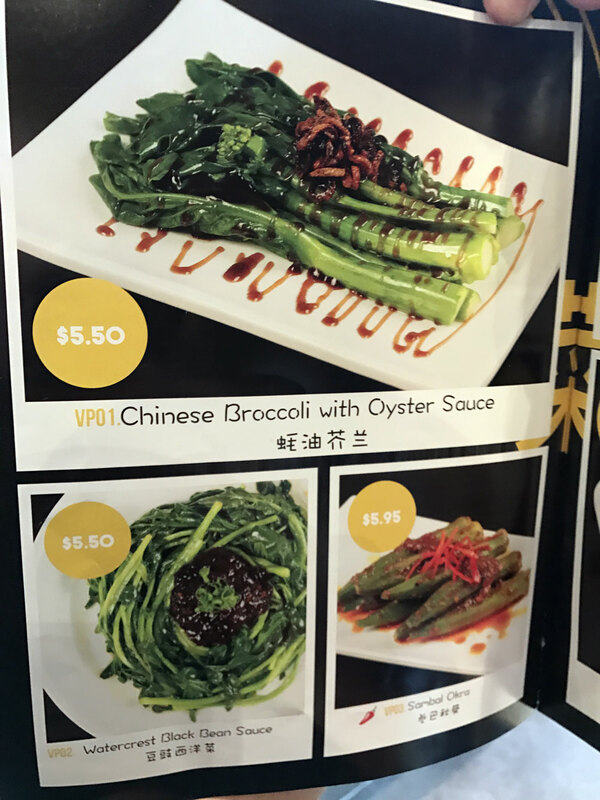 When you walk into Hong Kong City you'll find a surprisingly tasteful dining room - much nicer that you would expect for what you might call a hole-in-the-wall. 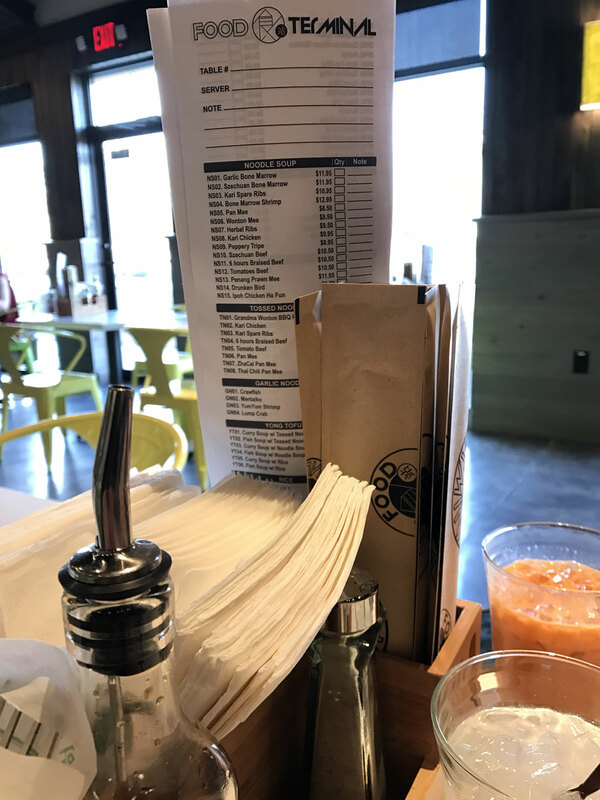 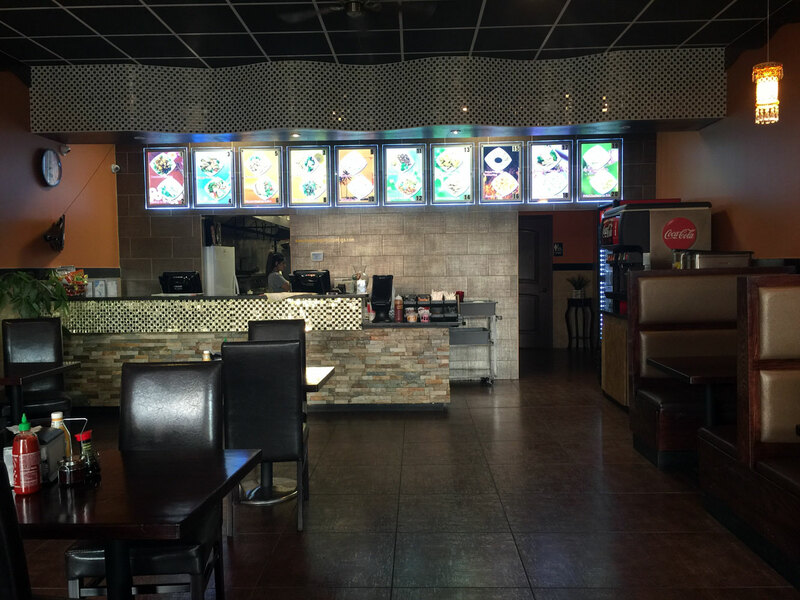 This is a fast casual experience so you order at the counter and wait for your food to be prepared at one of the tables or banquets. 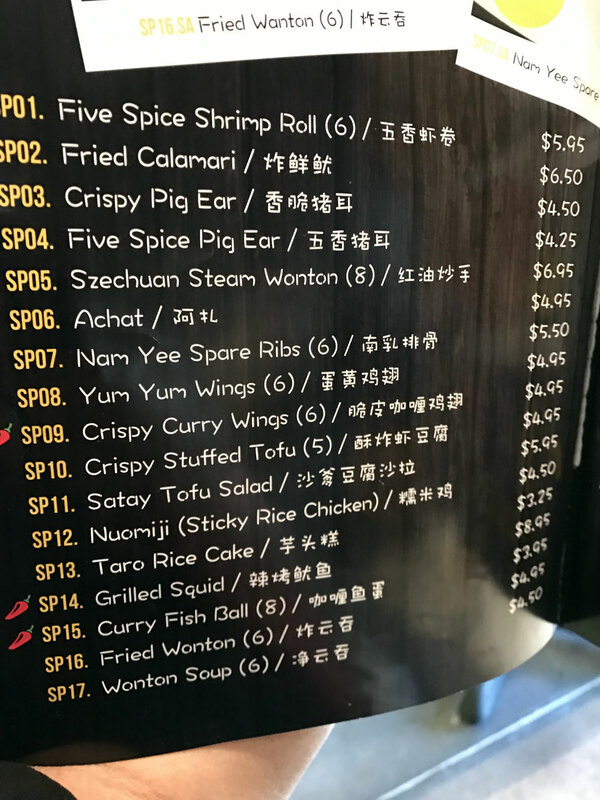 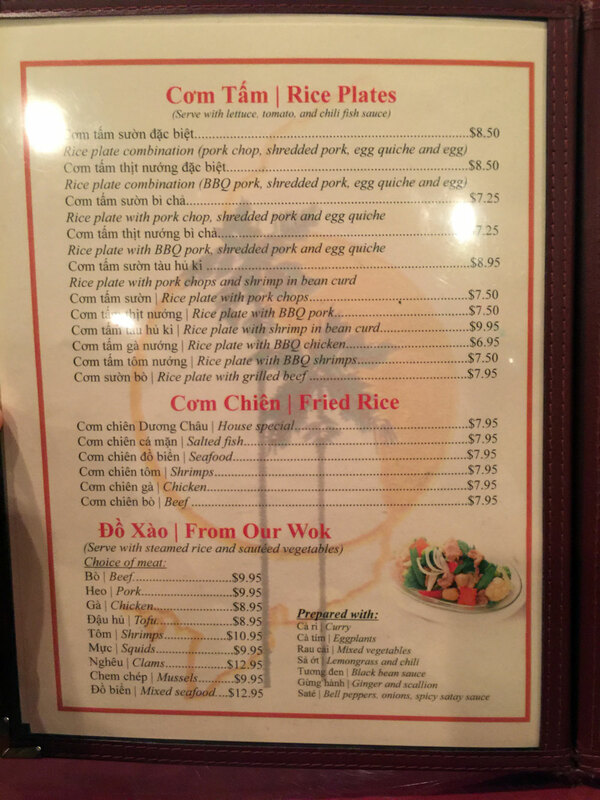 The food and menu contain your typical swag Chinese selections - your basic Americanized Chinese adaptations that most of us grew up with. 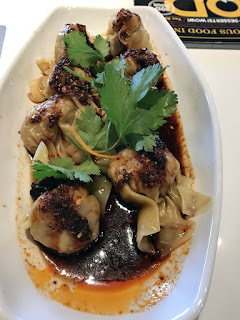 Steam Dumplings (8) - appeared to be chicken (but may be pork - difficult to tell). These were pretty bland and very doughy - they're probably better fried. 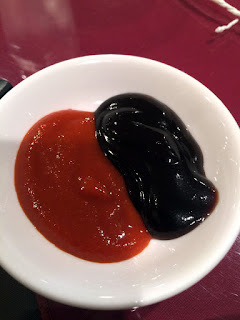 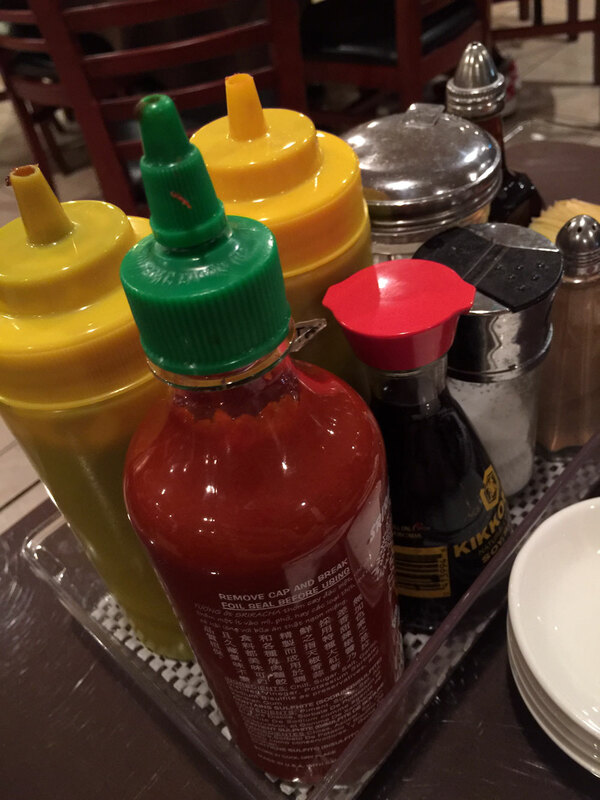 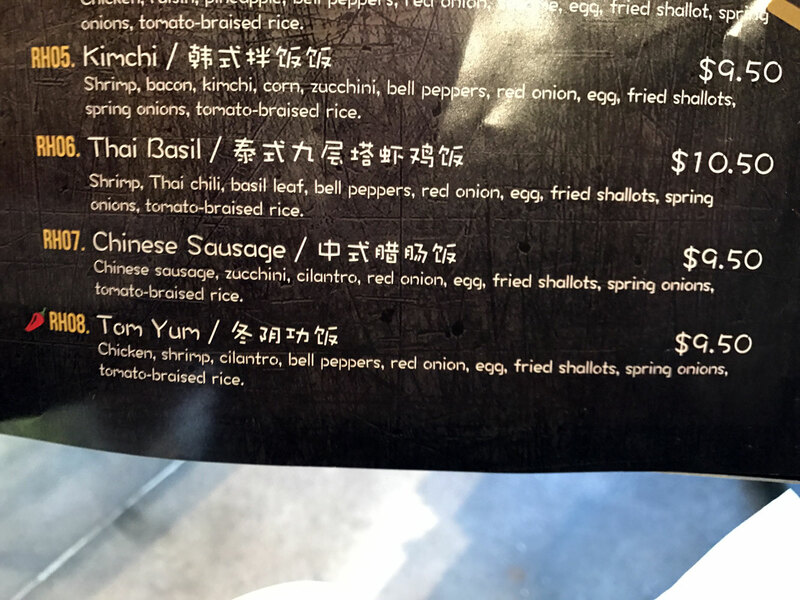 The sauce seemed to be all soy with very little vinegar. 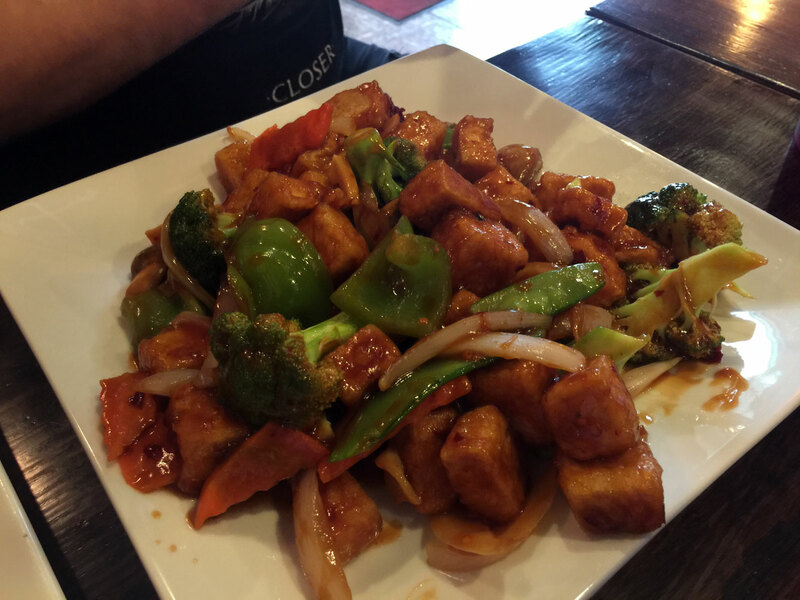 Dragon and Phoenix - from the Chef's Specials menu - General Tso's chicken and hot spicy shrimp - you can't really see the shrimp in there from the photo. 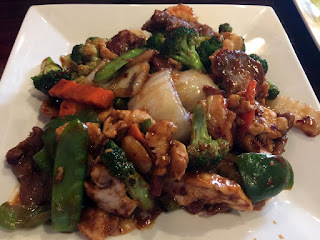 Four Seasons - Jumbo shrimp, beef, chicken, roast pork with vegetables in brown sauce - ordered extra spicy. I had this and it was good but I think it really needed the extra chili sauce. In general I was a bit disappointed in the food - my expectations weren't very high but influenced by the good Yelp reviews and if anything, the food was a bit below what I expected. 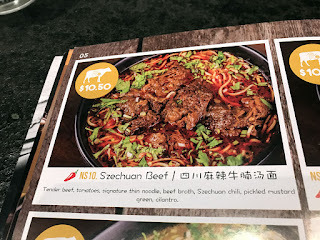 For what it is, it's fairly good and cheap. 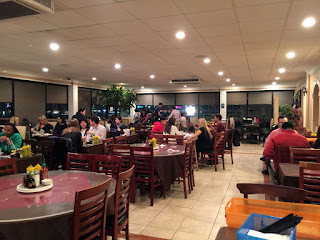 The issue I have with this restaurant is that it's on Buford Highway surrounded by many very exceptional Chinese cuisine restaurants - so why would you come here? Service was good considering it's "counter service" - someone did come by and refill our water glasses. I believe this is part of a local chain (at least i see other locations in Yelp/Zomato) - I'd call it above Panda Express - at least the food is freshly cooked - otherwise it's similar in my opinion. 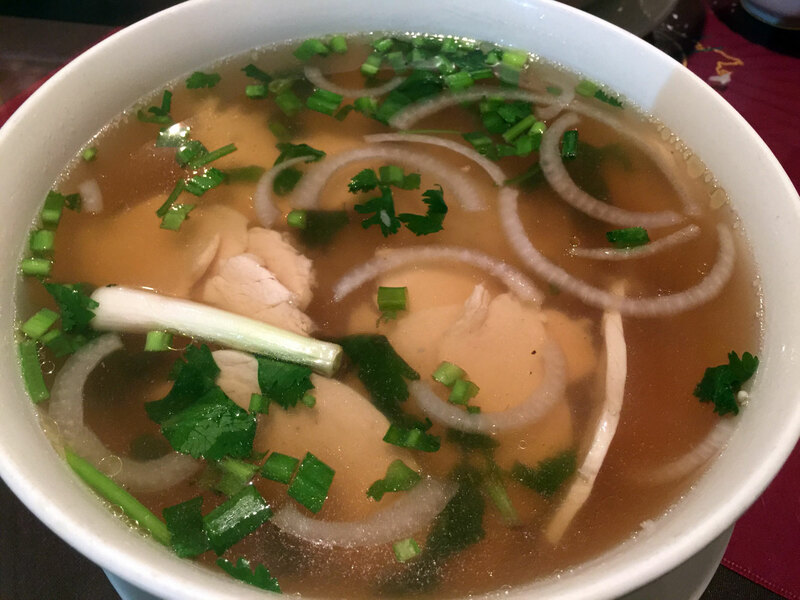 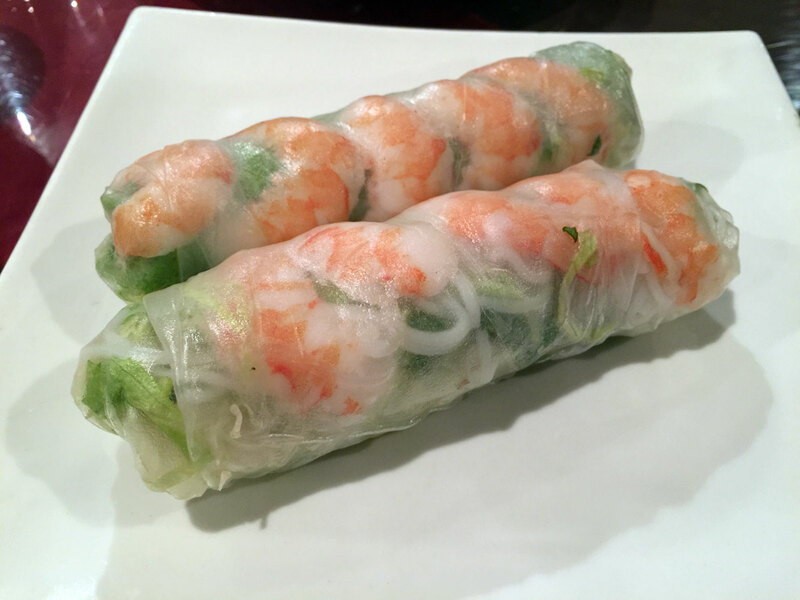 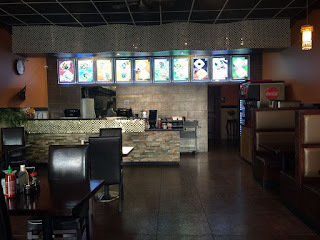 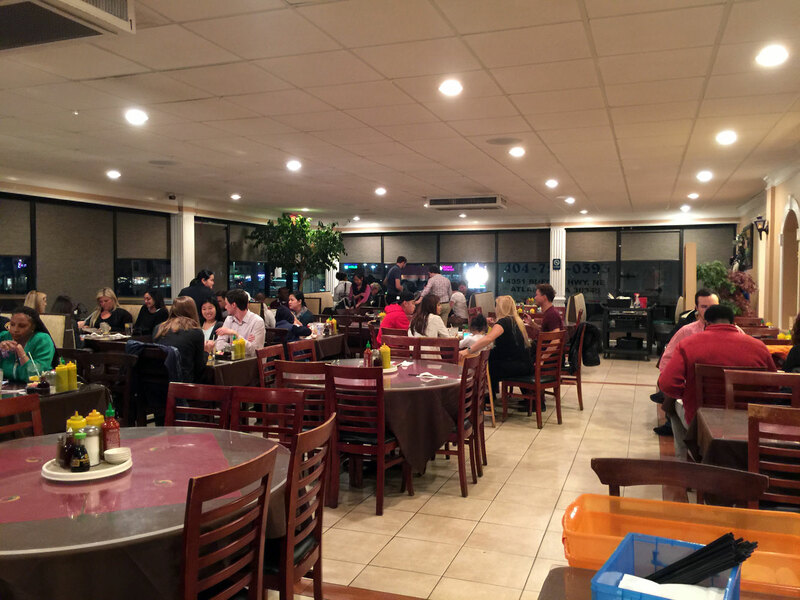 You can find this location of Nam Phuong at 4051 Buford Hwy NE, Ste A, Atlanta, GA 30345- this was previously the location of the exceptional Pho #1 sharing the same limited parking - careful that you don't block the other end (near the Asian grocer). 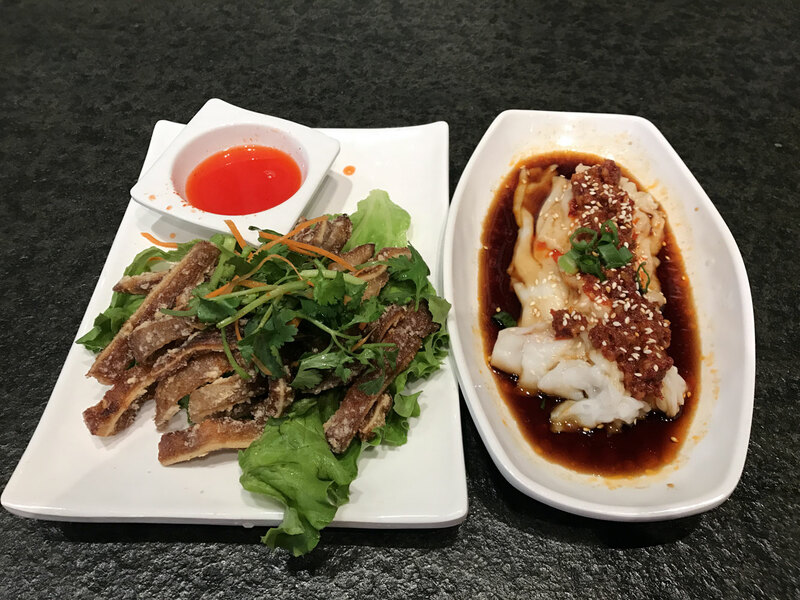 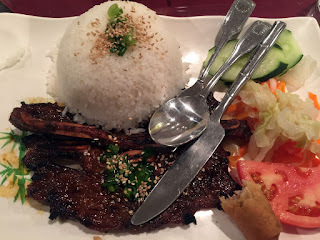 I was a bit hesitant to try Nam Phuong for quite a while as I had a hard time reconciling the changeover from Pho #1, one of my favorite Vietnamese restaurants. 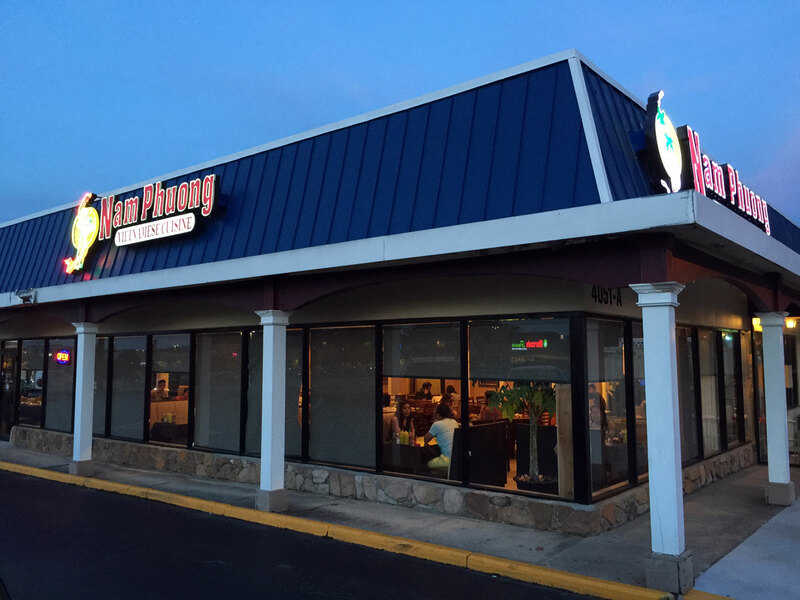 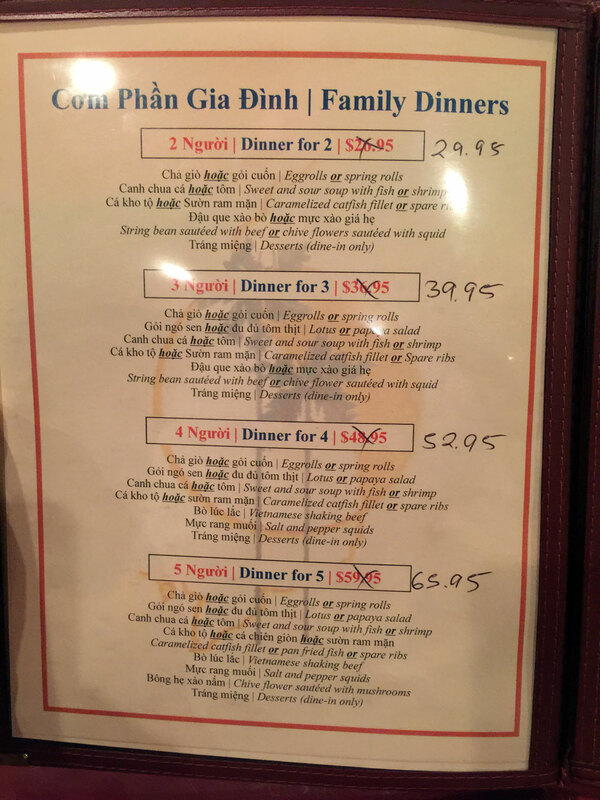 I finally broke down and found that if anything, Nam Phuong is even better! 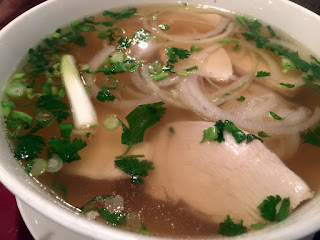 The pho here is top-notch with the rich broth you would expect from the better pho restaurants. 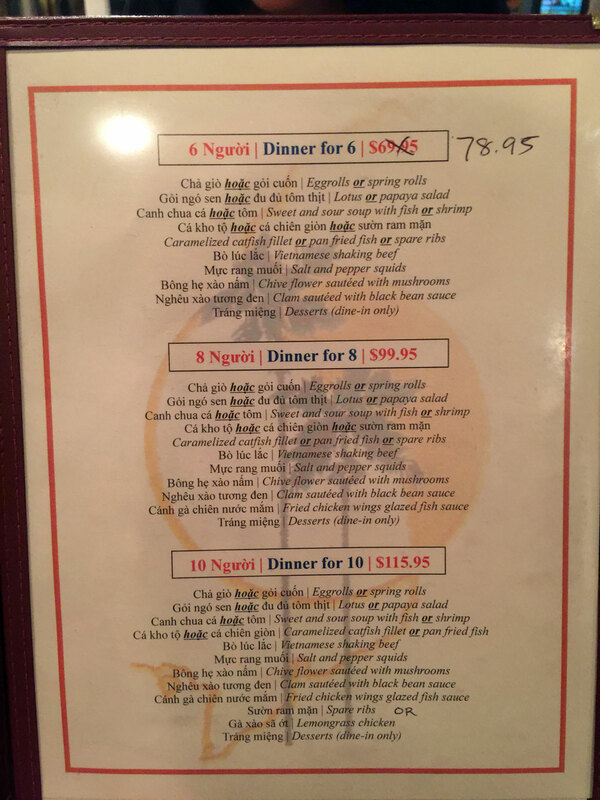 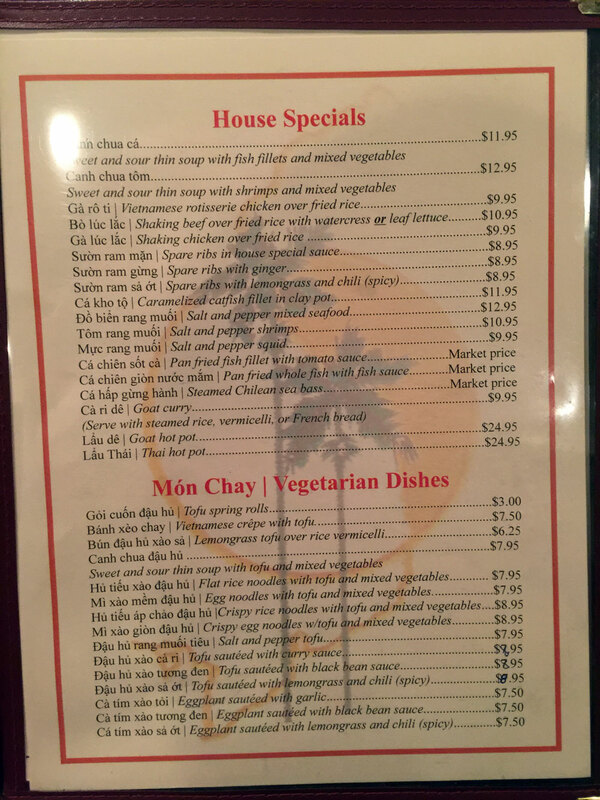 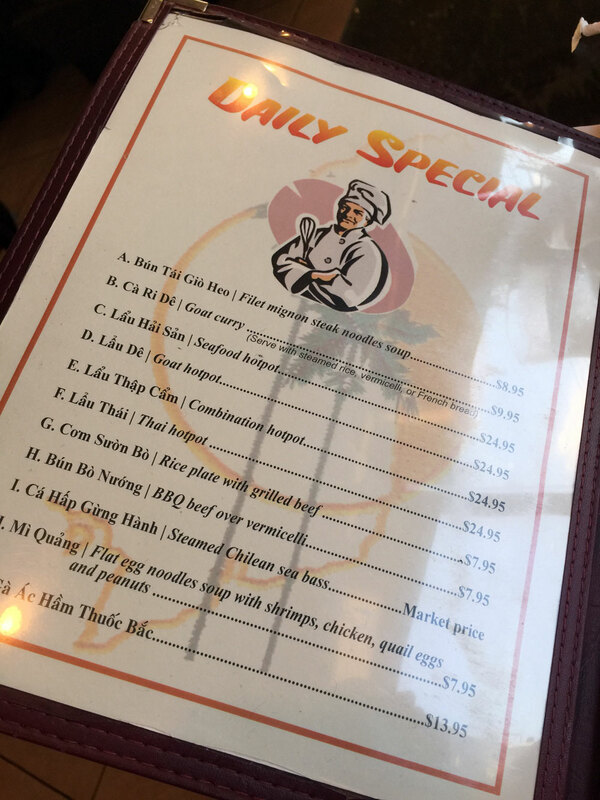 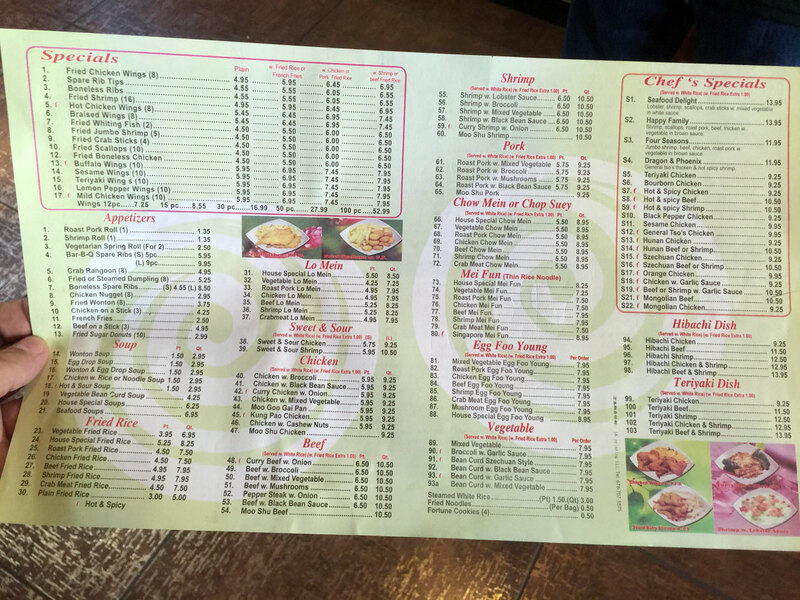 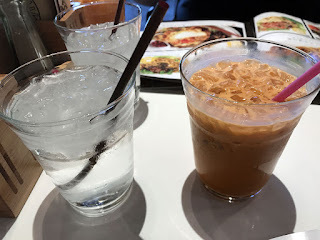 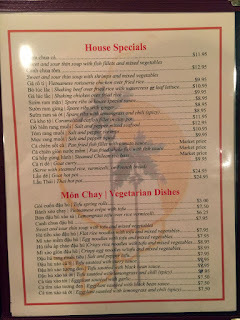 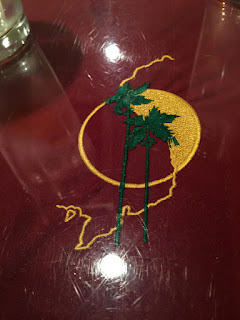 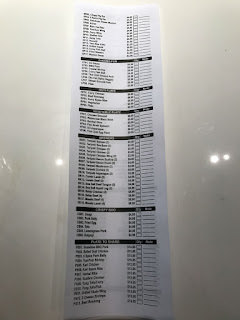 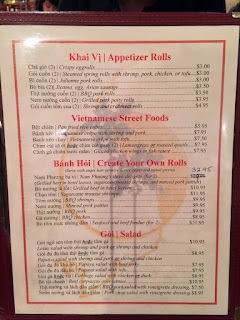 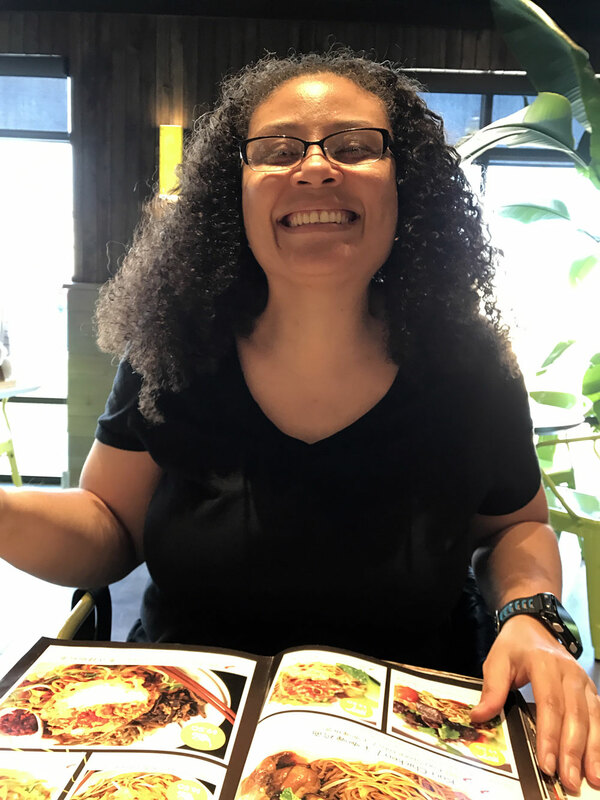 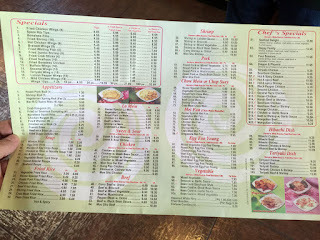 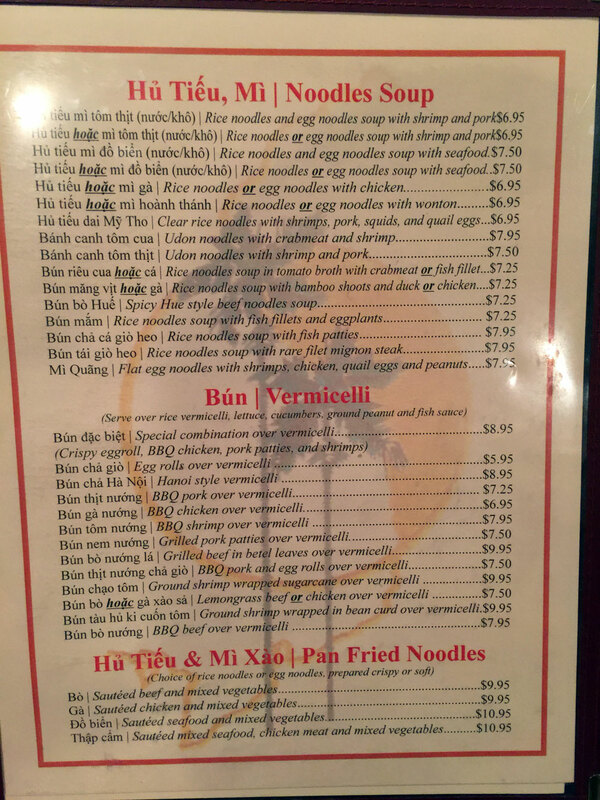 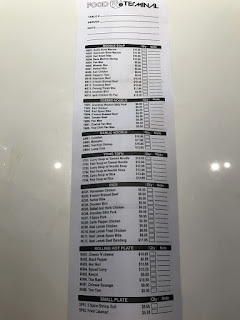 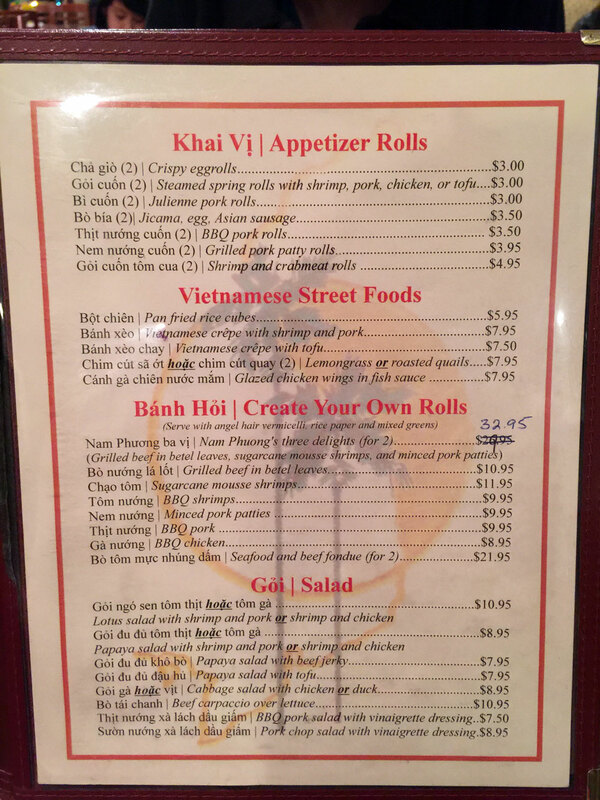 What's remarkable is that the menu is extensive and full of delicious items - this has become my new go-to restaurant for pho and Vietnamese, it's just that good and consistent. 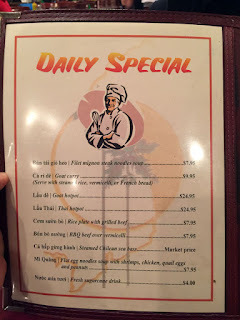 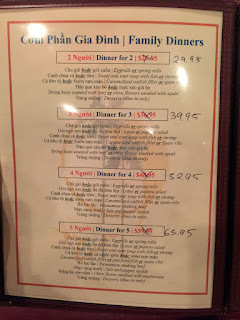 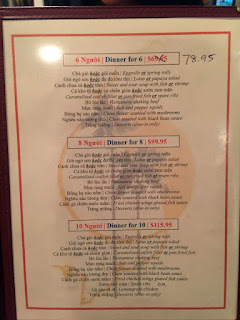 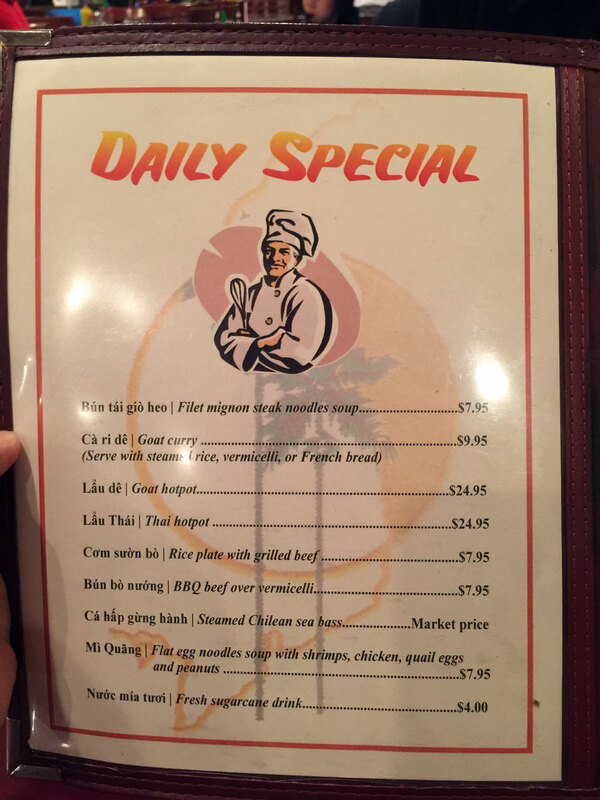 The menu as mentioned is quite extensive but look at the Daily Specials in front - all I've tried are exceptional. 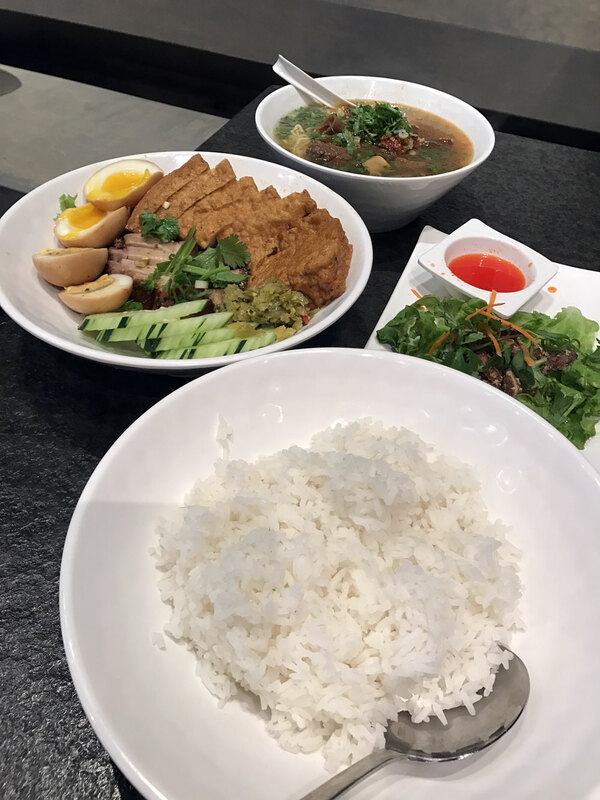 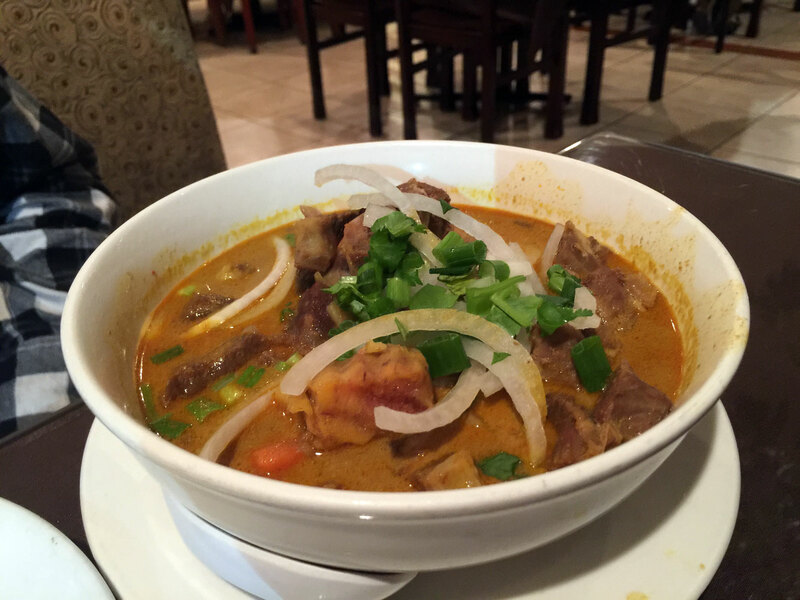 Next are sections for: Kha Vi (appetizer rolls), Vietnamese Street Foods, Banh Hoi (Create Your Own Rolls), Goi (salad), Chao (rice porridge), Sup (soup), Bo Kho (beef stew), Pho (beef noodles soup), Hu Tieu, Mi (noodles soup), Bun (vermicelli), Hu Tieu & Mi Zao (Pan fried noodles), Com Tam (rice plates), Com Chien (fried rice), Do Xao (wok dishes), House Specials, Mon Chay (vegetarian dishes), Family Dinners for 2-10, Giai Khat (beverages), and Mon Moi. 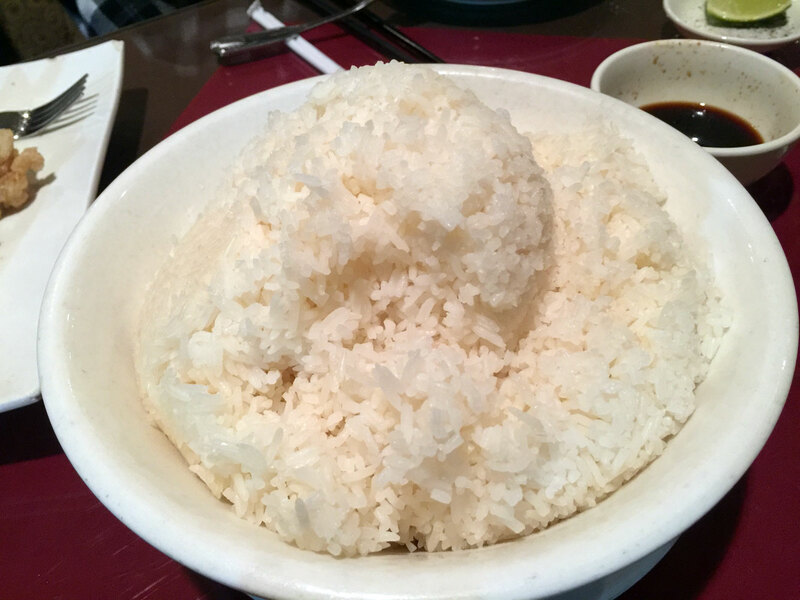 If you want an interesting appetizer, try the Bot Chien - Pan friend rice cubes. 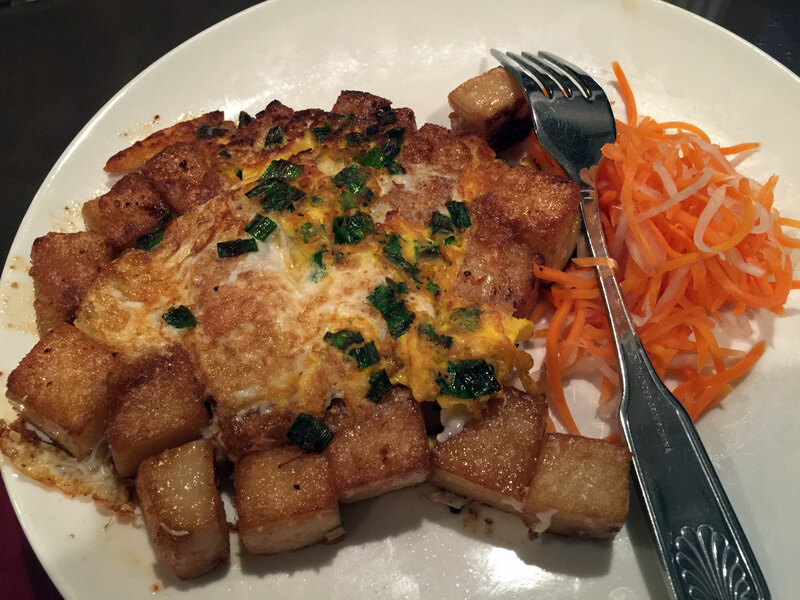 These delicious starchy cubes are encrusted with fried egg and green onion and served with a vinegary soy - so delicious. 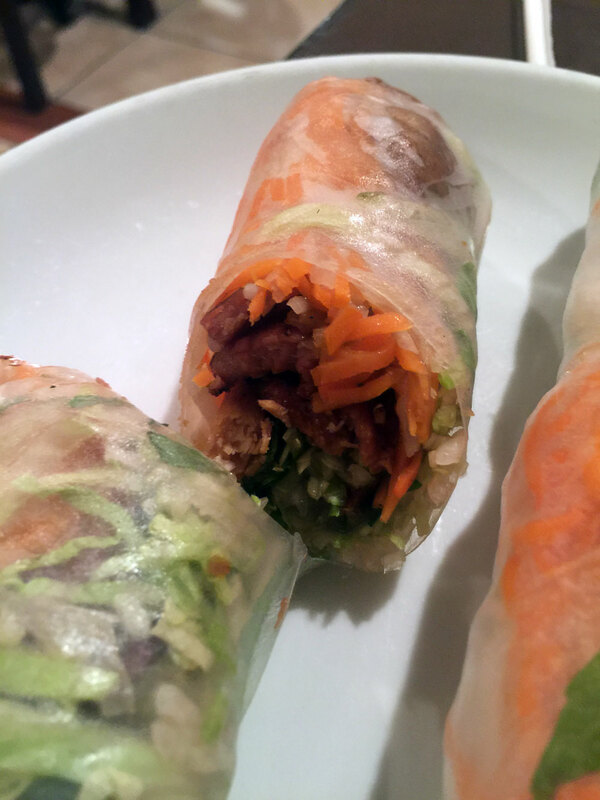 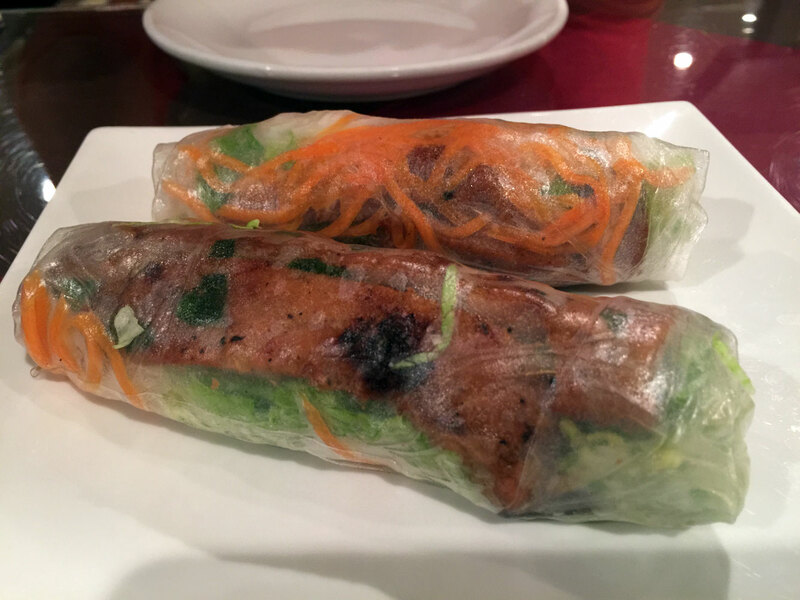 My favorite rolls are the Thit nuong cuon - BBQ pork rolls - these delicious smokey pork rolls are, I believe, the best I've ever had. 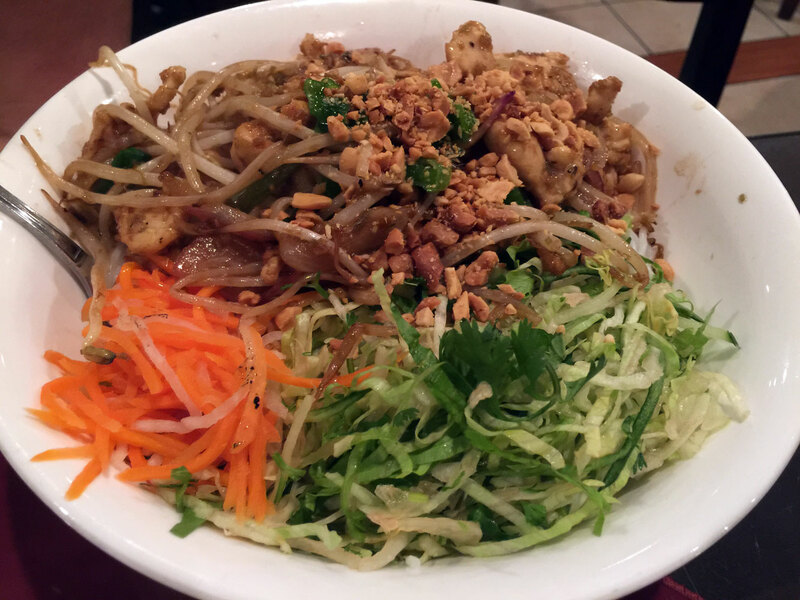 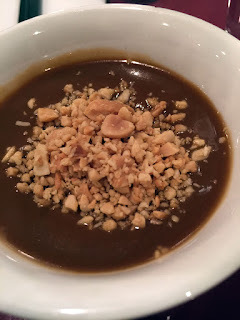 The peanut sauce is thick and rich and spot-on. I could eat a couple of orders of these and call it a day. 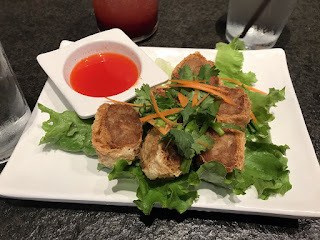 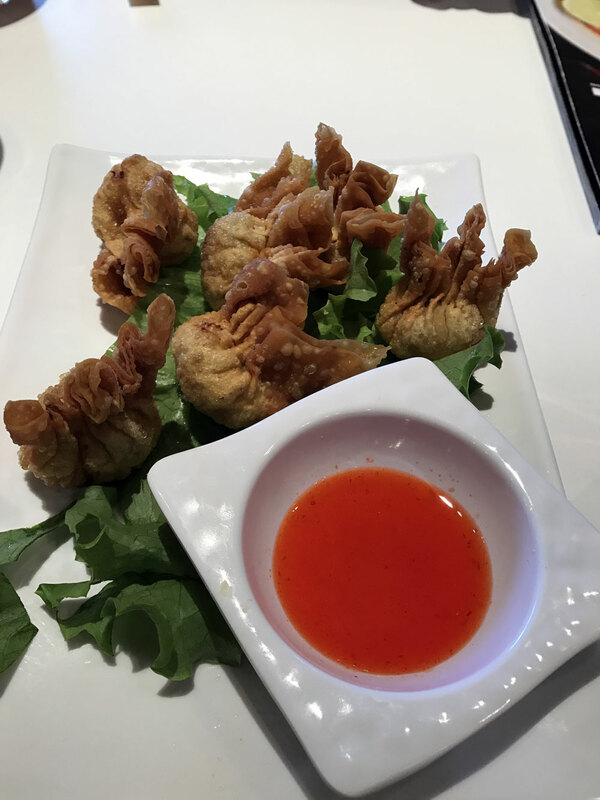 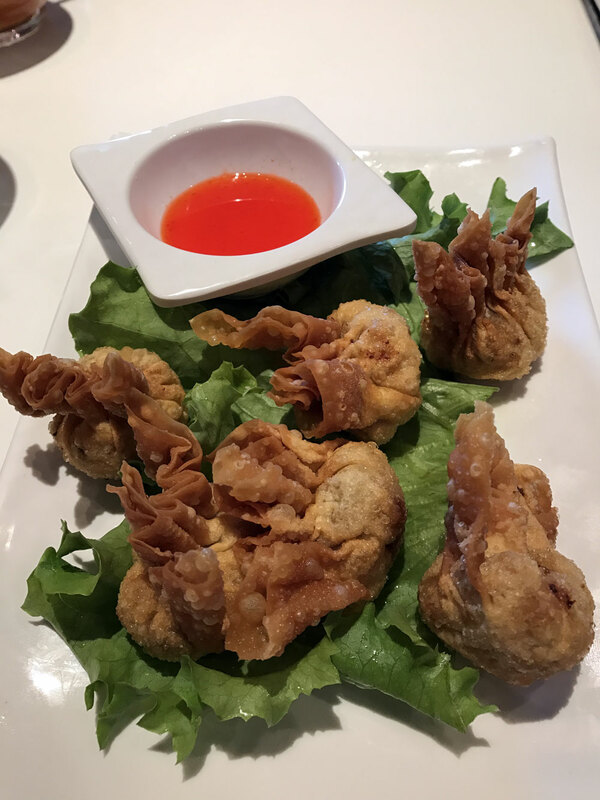 I've also had the shrimp rolls (to appease the pork haters) and they are good but after trying the BBQ pork they seem to lack in something (jaded, I know). 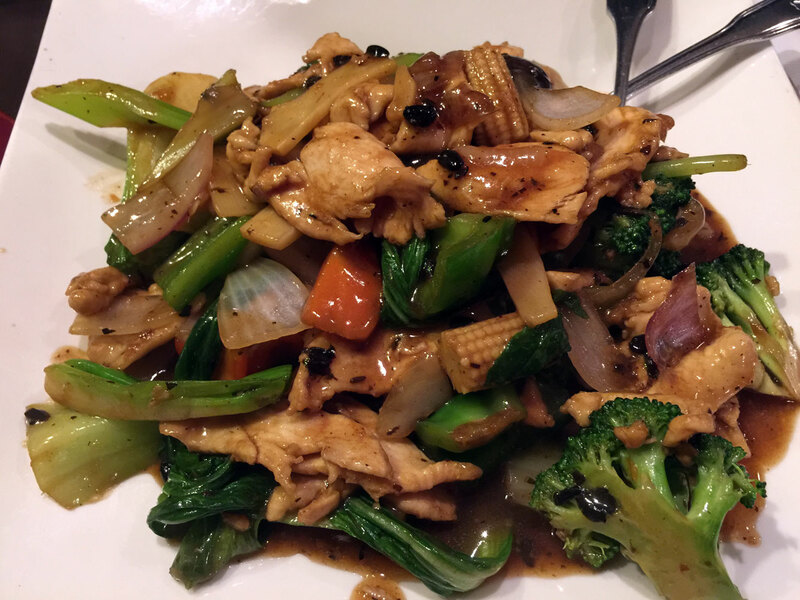 Ga rau cai (chicken with vegetables) in Black Bean Sauce - they know how to use a wok for sure! Papaya salad with shrimp and chicken - quite good and I think there's actually some papaya in it (I always question this at other restaurants). 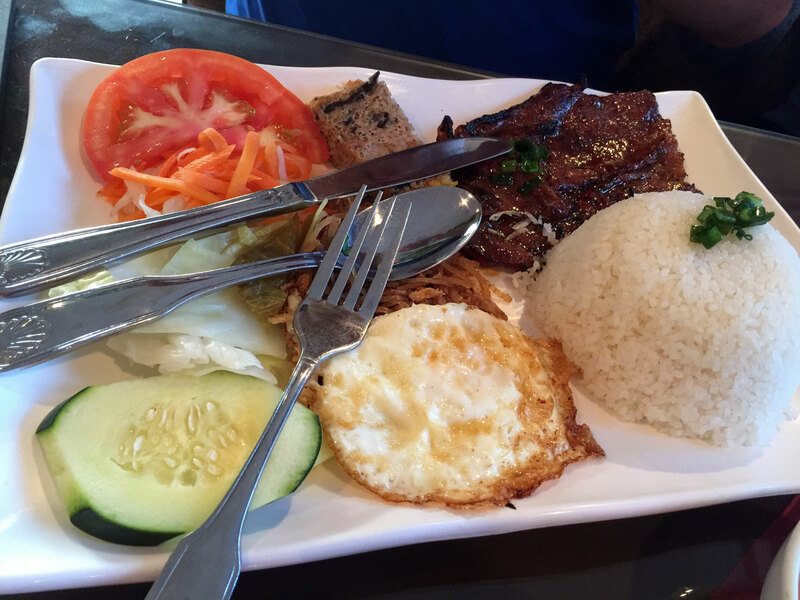 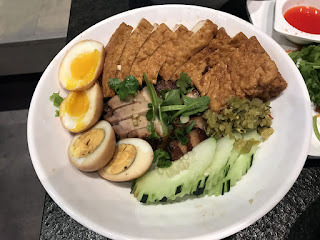 Com tam thit nuong bi cha (Rice plate combination) - BBQ pork, shredded pork, egg quiche and egg - this is an awesome mixed combo plate and quite filling. 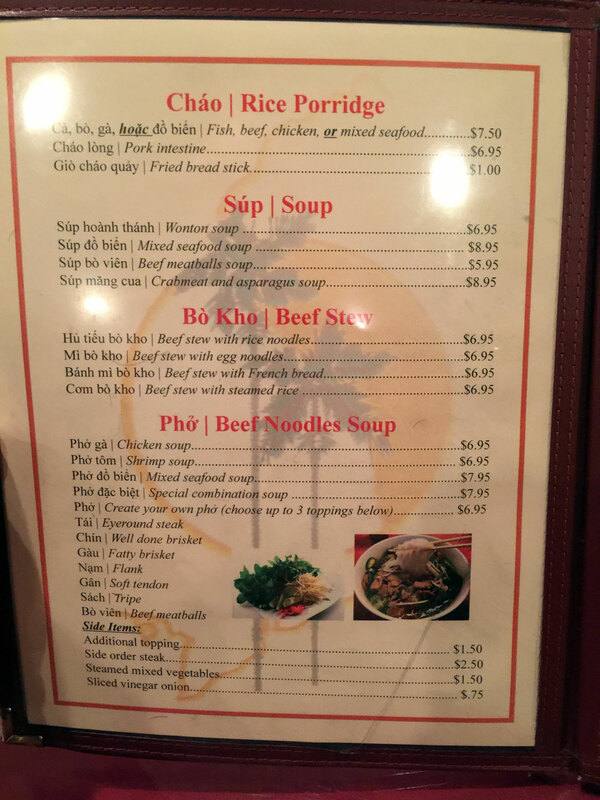 I usually settle for the pho, and in particular the chicken pho (pho ga) or pho with chin (well done brisket), tai (eyeround steak) and nam (flank). 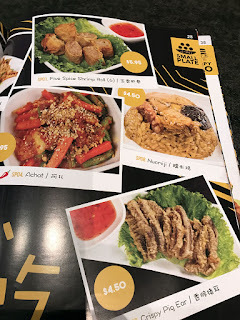 The service here is usually quite good - however the place is regularly slammed with lots of big parties sharing huge meals so account for that. 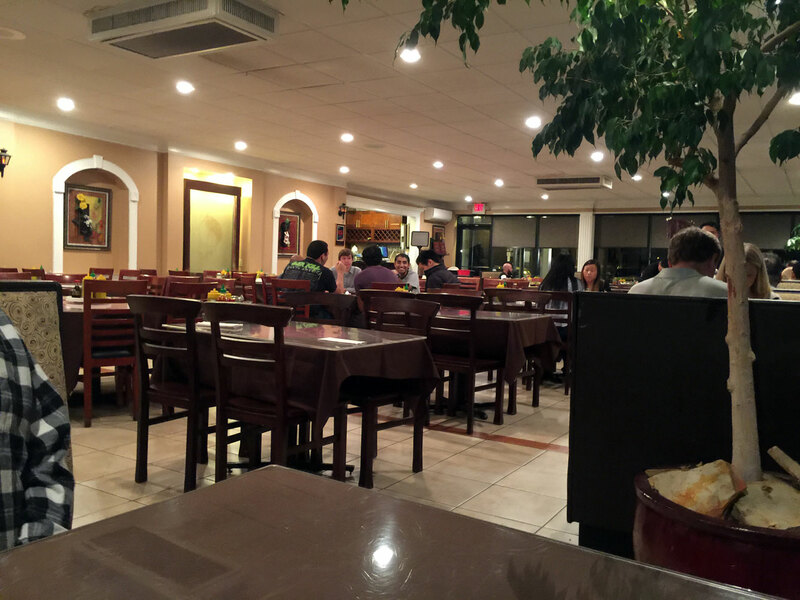 Better to come during weeknights at slightly off hours (early evening or late - early is better). 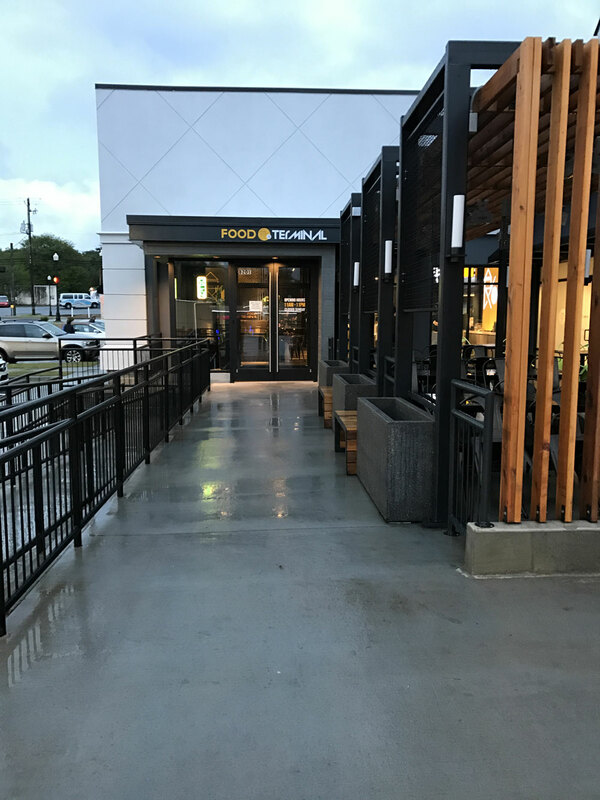 The only real negative is the parking - when it's busy there is none - almost better to park across the street and walk over. 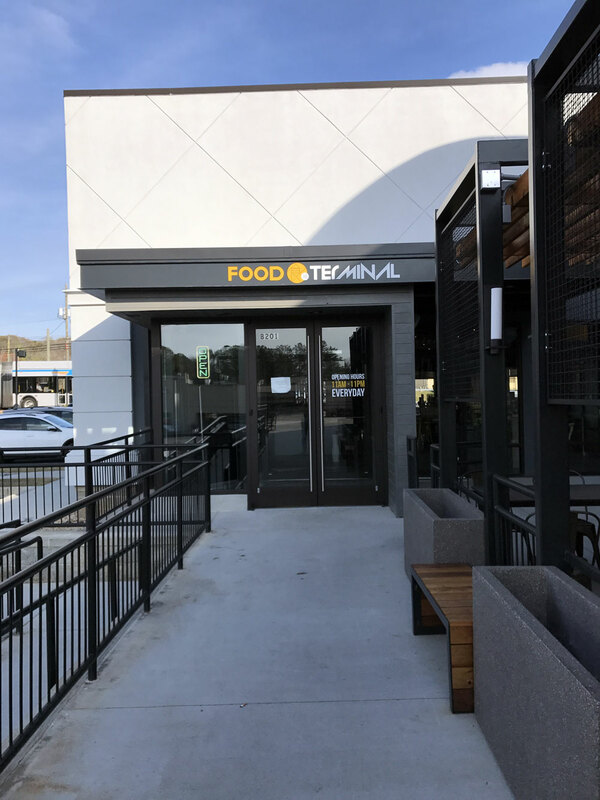 You can find Food Terminal at 5000 Buford Hwy NE, Ste B201, Chamblee, GA 30341 - this is a building in the front of the City Farmers Market lot (the market across from Halal Guys but a bit further north on BufHy). There's plenty of parking out front, to the side or in the shopping center lot. 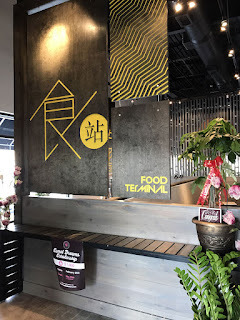 Much has been said about Food Terminal so I'll try to keep this as brief as possible - I've now eaten here twice and love this place. 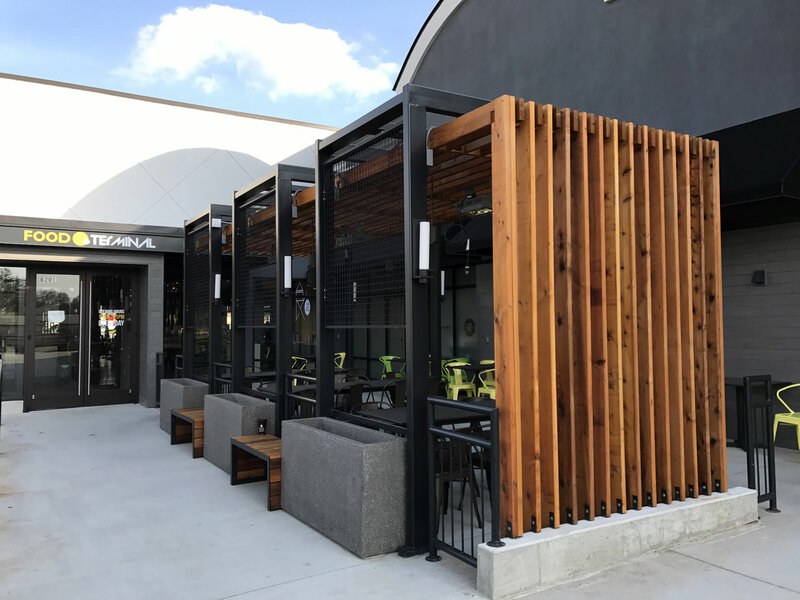 Whoever did the design work did a stunning job - there's an Asian chic to the place that's totally enhanced by the industrial vibe, with plenty of wood finishes and classy touches all around. 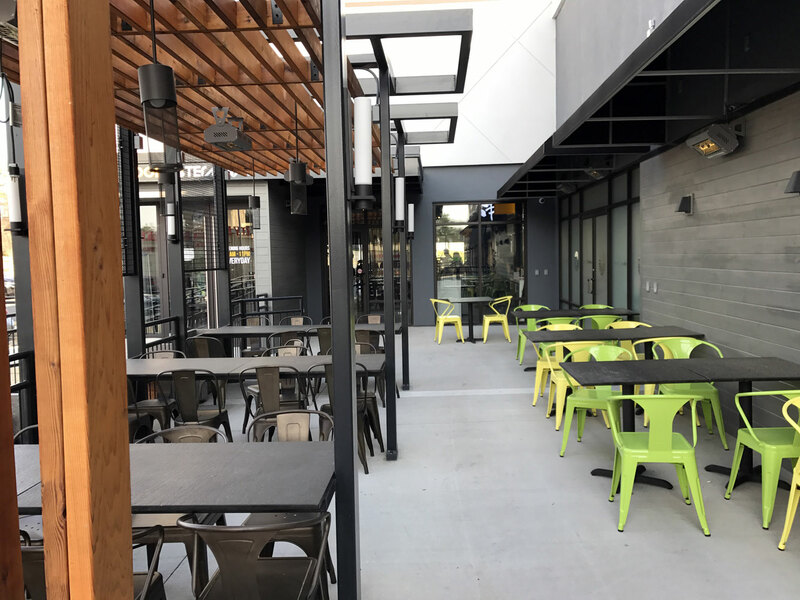 The interior reminds me a bit of Cafe Alon at Perimeter - expansive spaces with just enough detail to direct your eye to the immediate space. 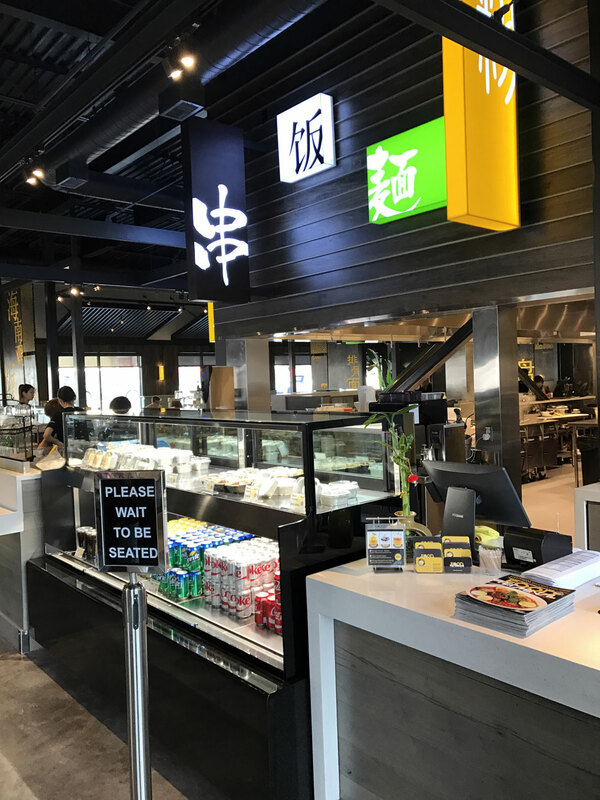 As you walk in the host station is in front with a dessert counter to the right - the right-hand counter extends to an open kitchen. Dining is in the areas behind (there's also a fairly large patio that I can see myself visiting often). 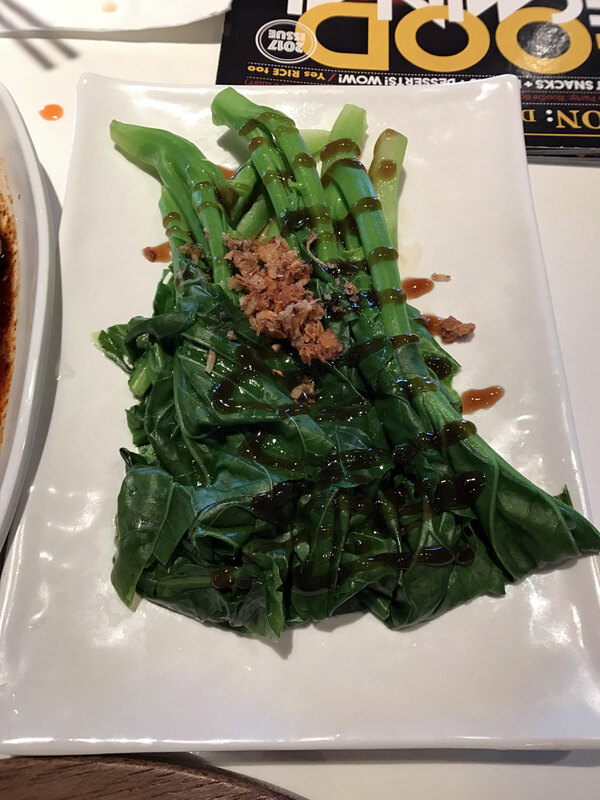 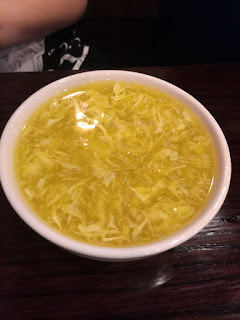 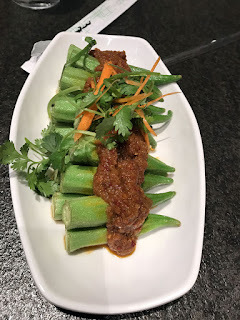 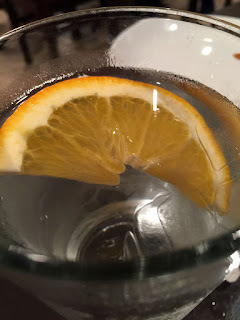 Some of my friends have already reviewed the various dishes and many of the comments I've heard have been "well this was OK but it's better at "x" - which I find interesting. 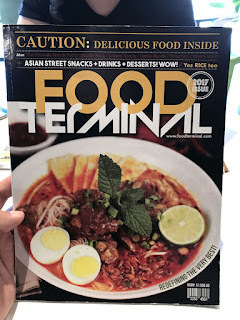 My own experience has been that while I've had better of some of these dishes, the magnitude off the offering at Food Terminal is overwhelming. The menu is designed as a glossy print magazine complete with Table of Contents and plenty of photos - once again a stunning design. 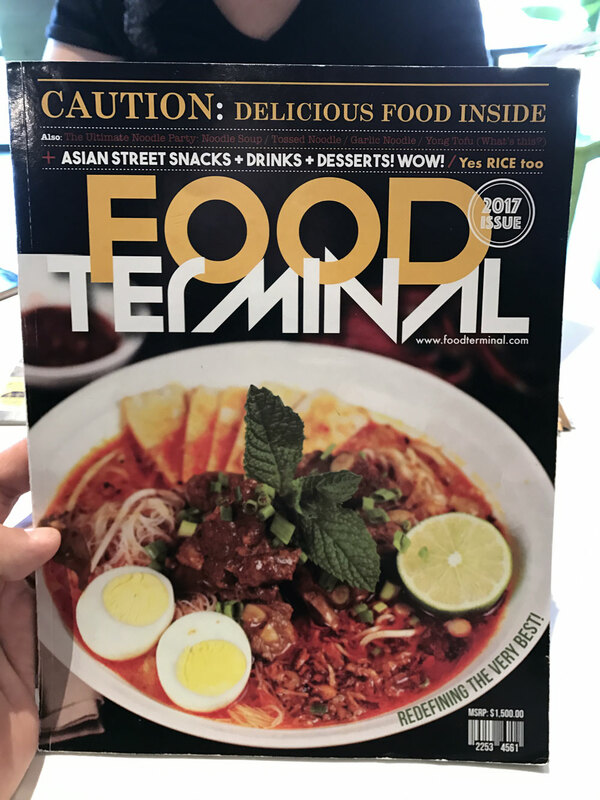 Food Terminal is noted as a Malaysian Street Food restaurant and the various styles of cooking is amazing - there's a touch of Thai, a pinch of Chinese and even a bit of Japanese (and of course the Malaysian). 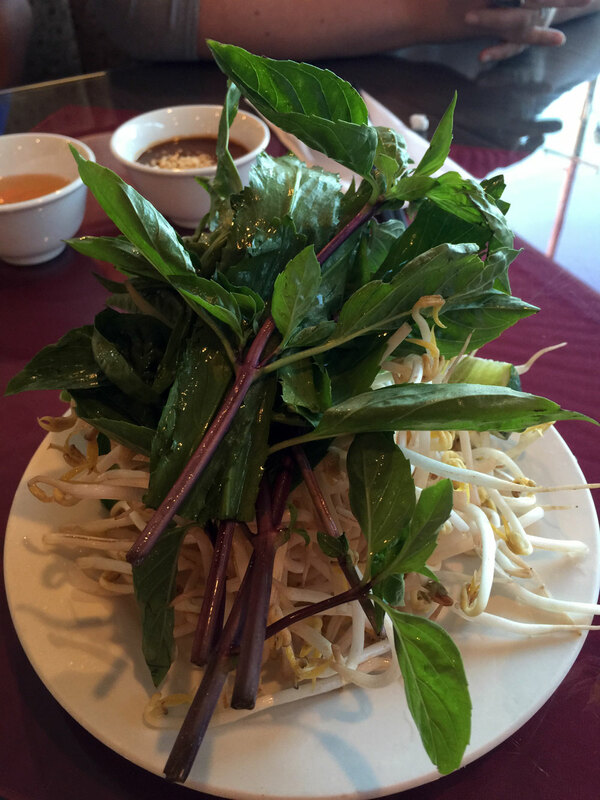 You just won't find this variety anywhere else and that by itself makes it worth visiting. I've now eaten here twice, first with fellow Yelper Michelle T and about a week later with Yelper John F (who also leads an awesome BufHy Restaurant Crawl - now in it's second round). 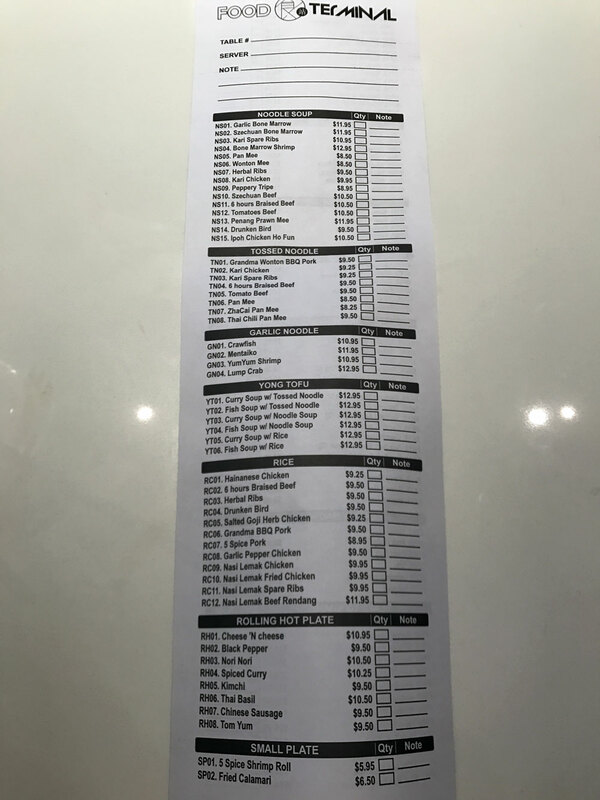 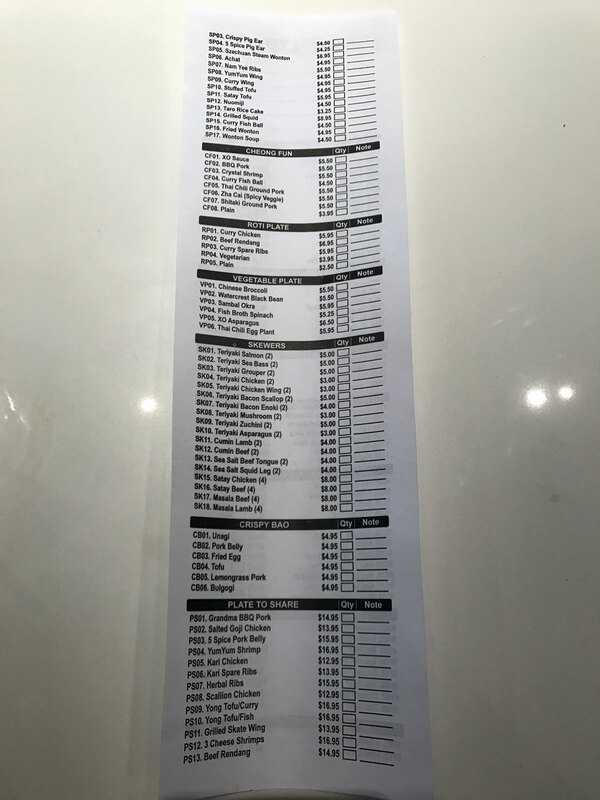 Once you've picked some items you fill out a sheet much like you would at a sushi bar. Here's a rundown of what I've tried and some general comments. 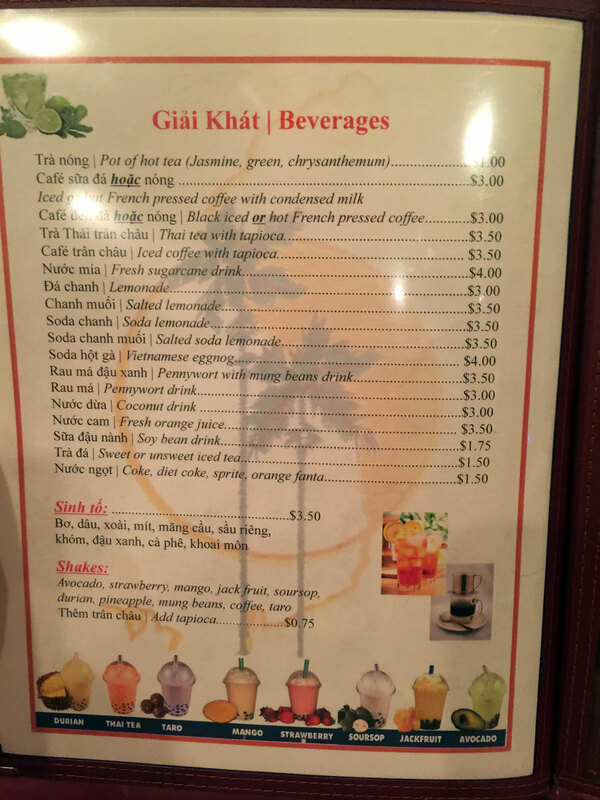 * Thai Tea - it's the real-deal here and not that premixed crap. 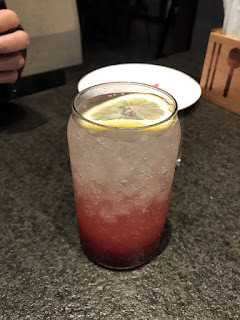 * Raspberry Lemonade Soda - John F had this so I can't comment other than he said it was much like the soda offered at Sweet Hut. * Five Spice Shrimp Roll - first bite not impressed but they grow on you. 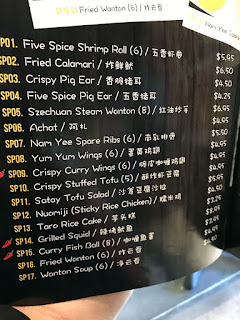 There's a subtlety here that you don't get in the initial bite. 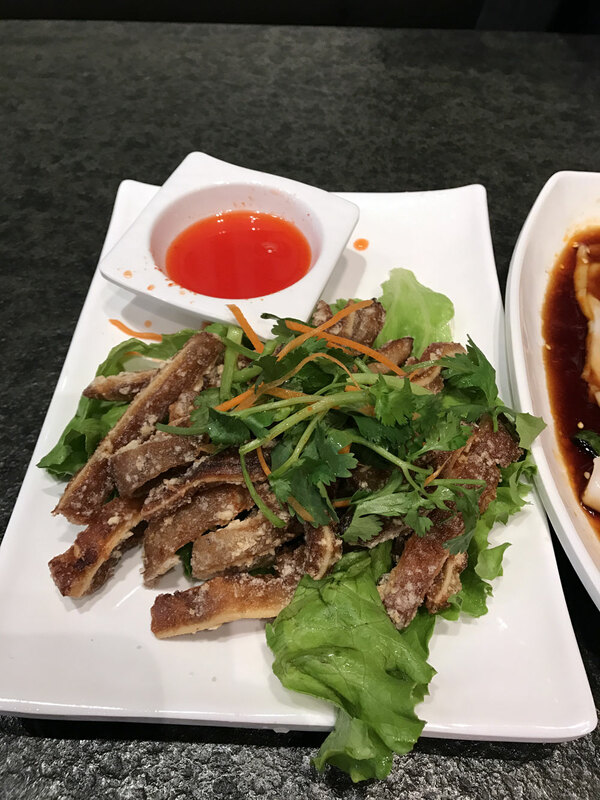 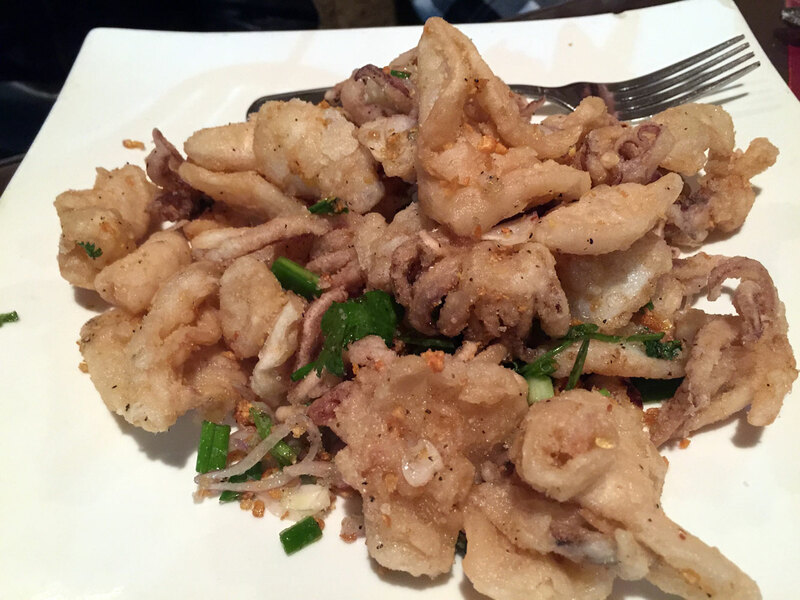 * Crispy Pig Ear - surprisingly delicious and melt-in-your-mouth. 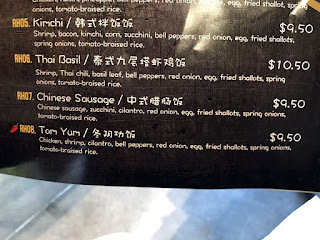 They really aren't crispy at all, despite the name. 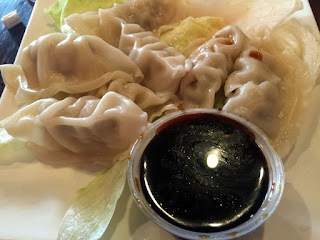 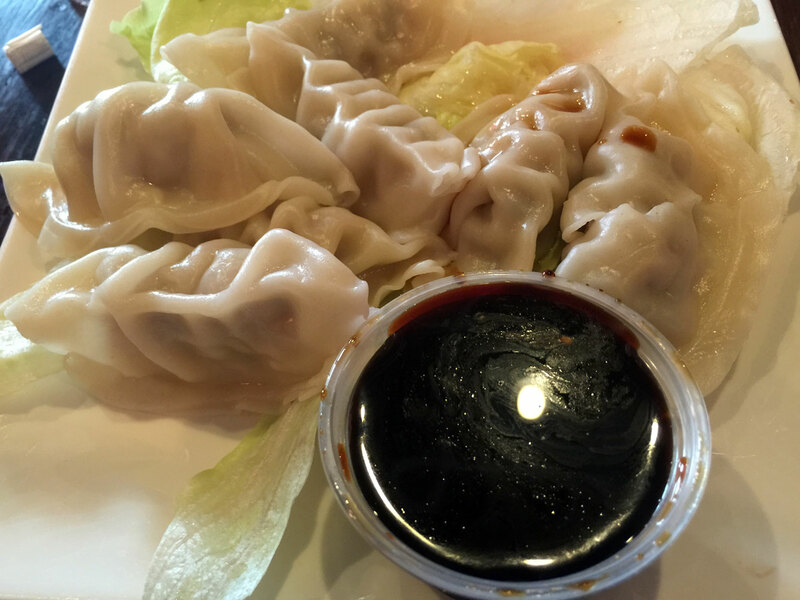 * Szechuan Steam Wonton - love these - steamed wontons covered in pepper oil and delicious. 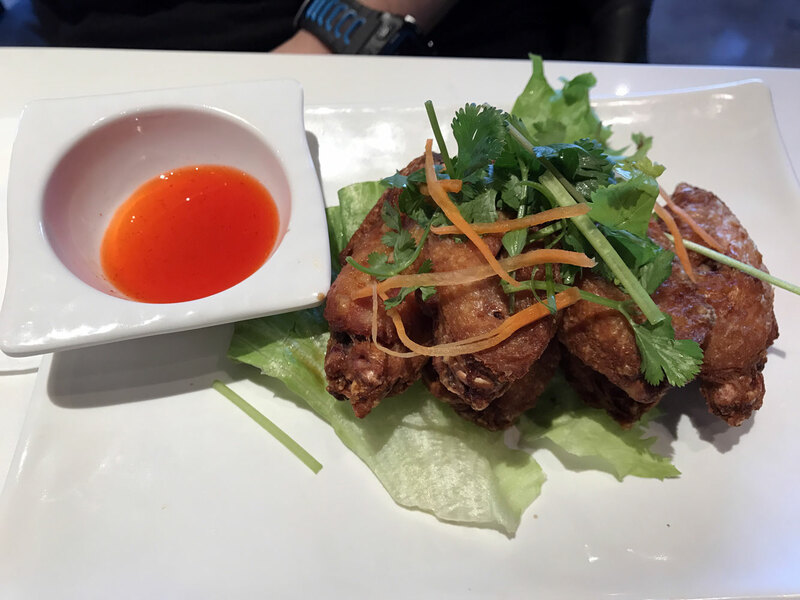 * Crispy Curry Wings - not impressed - they came off as fried wings without any real seasoning. 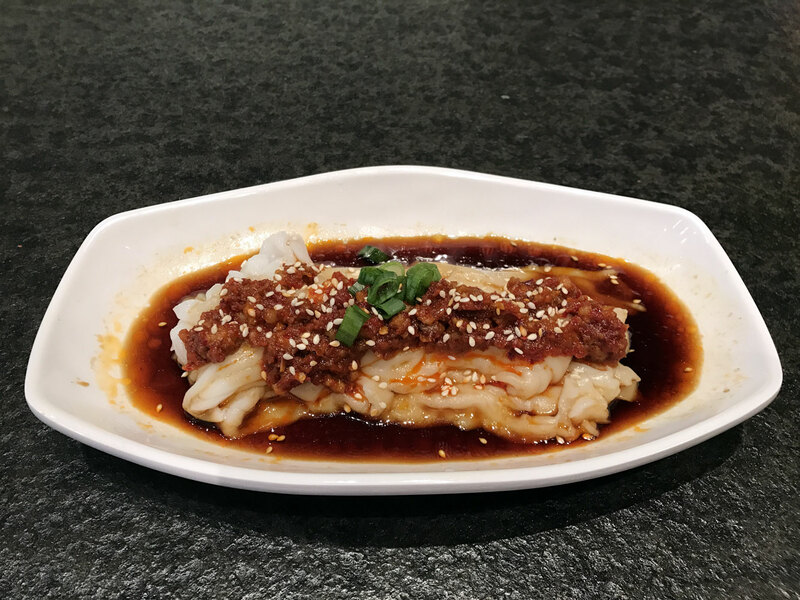 * Thai Chili Ground Pork Cheong Fun - delicious - this is a mas of unseparated noodles with a bit of spicy pork and sauce - delicate and quite good. 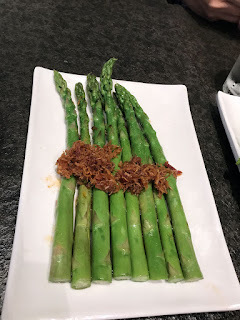 * XO Asparagus - disappointing - this is basically just steamed asparagus with little to make it distinctive. 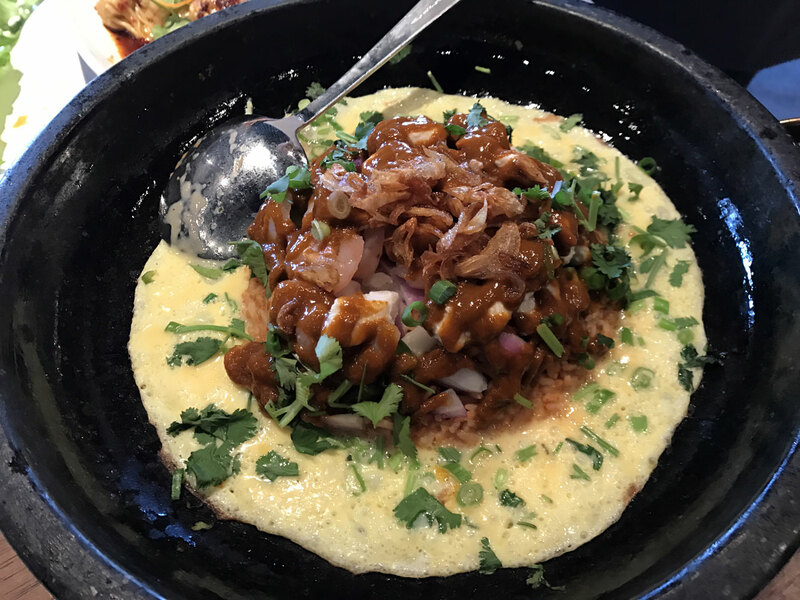 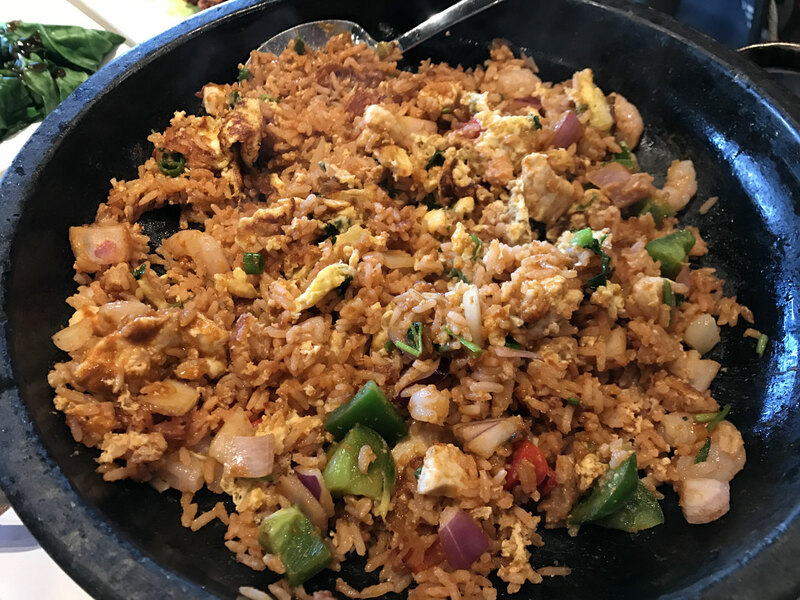 * Tom Yum Rolling Hot Plate - similar to the Korean Bokkeum Bap served on a hot plate - good and you'll taste the lemon grass, but a little lacking in flavor. 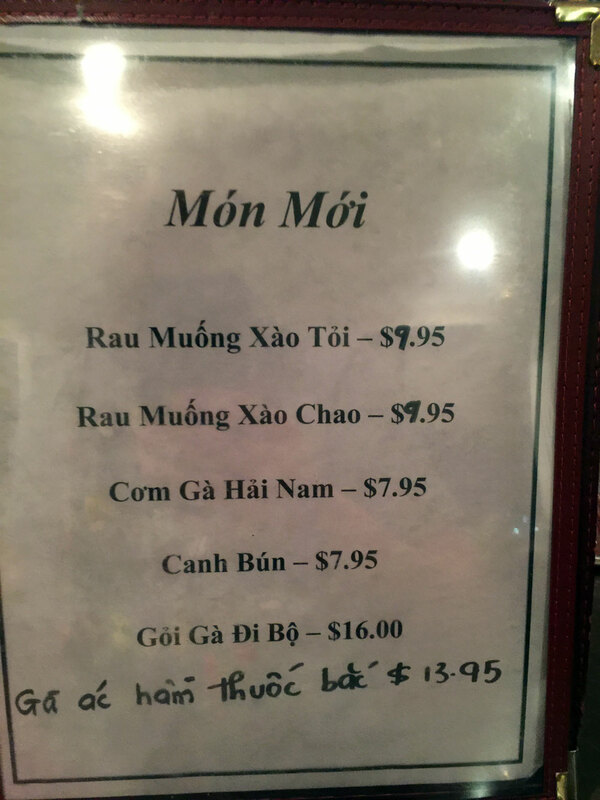 Next time I'll try one of the other offerings. 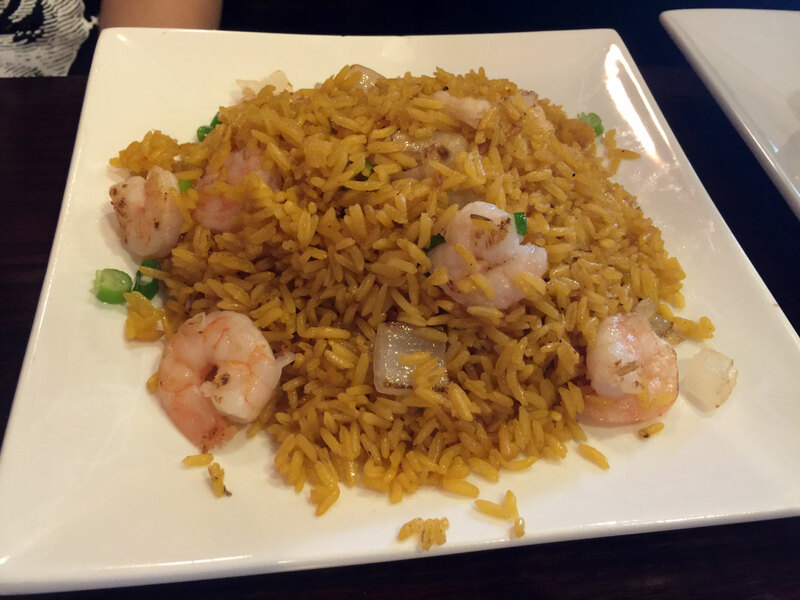 Order this like you would fried rice. 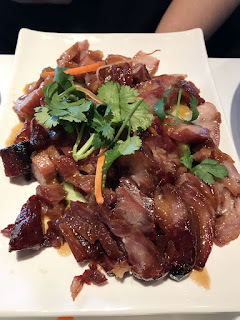 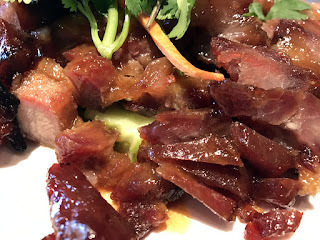 * Grandma BBQ Pork - delicious sweet-glazed pork bits - probably the best entree I've tried. * 5 Spice Pork Belly - very filling but could have used something spicy (order a side of sriracha to fix that). The fried tofu, while broadening out the dish as far as content didn't seem to add much to me. 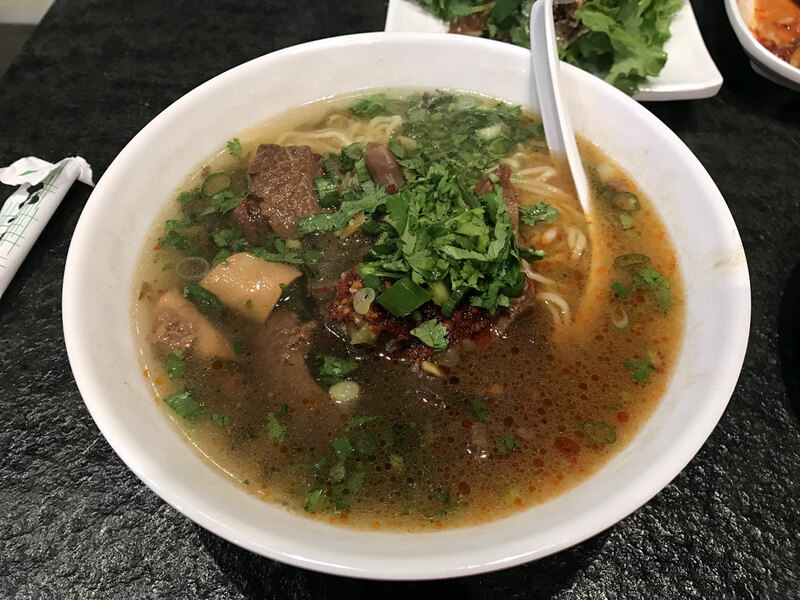 * Szechuan Beef Noodle Soup - This was good but a little disappointing - the broth wasn't very robust (but that may be me comparing it to all the great Ramen available in town). 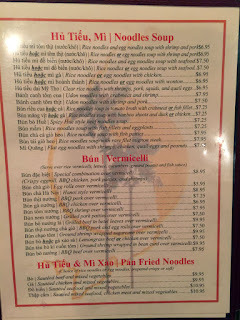 Also lot's of attached tendon int he broth that some non-Asians may not care for. 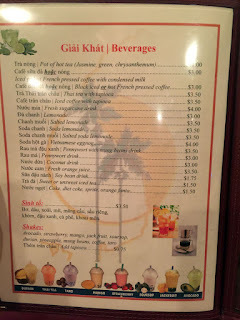 * Mango Fever - Mango Puree, Mango Ice Cream, Diced Mango and Sago - I wasn't sure what Sago was so I looked it up - it's the starch extracted from palm stems - think of these as mini-tapioca balls. Loved this dessert and it's easily shared by 2 people. The service both times was exceptional - with all the experience the restaurant owners have with Top Spice and Sweet Hut, they certainly know how to take care of diners. 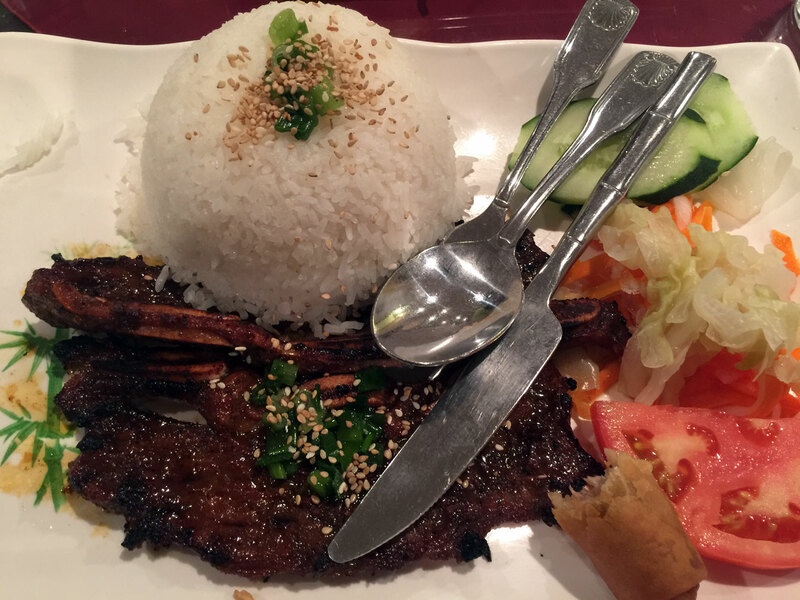 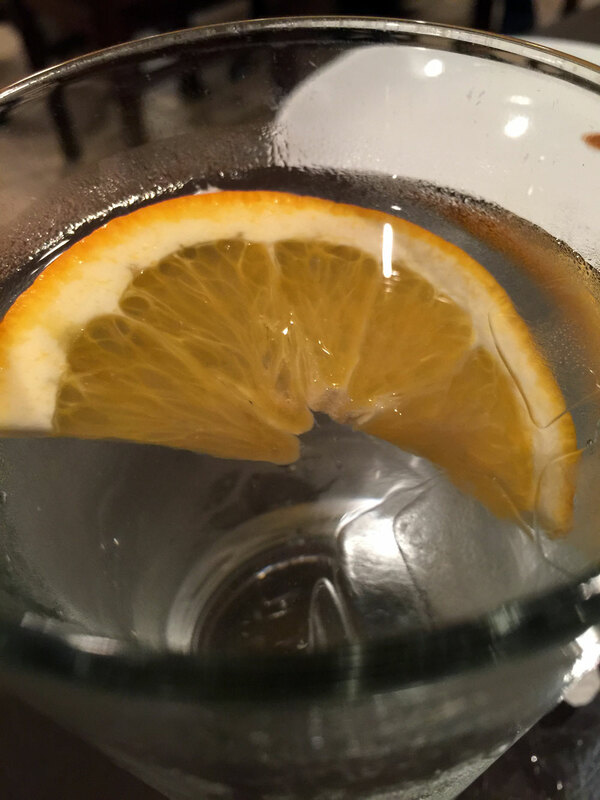 It's fast, friendly, efficient and the servers know the food so they can make recommendations. All around my experiences have been great. 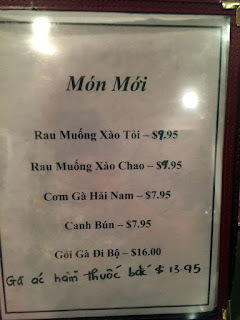 Cost per person (2 apps, 2 veggies, entree, specialty drink) was around $30 but you certainly don't need to go that far to get full - we just wanted to try everything!